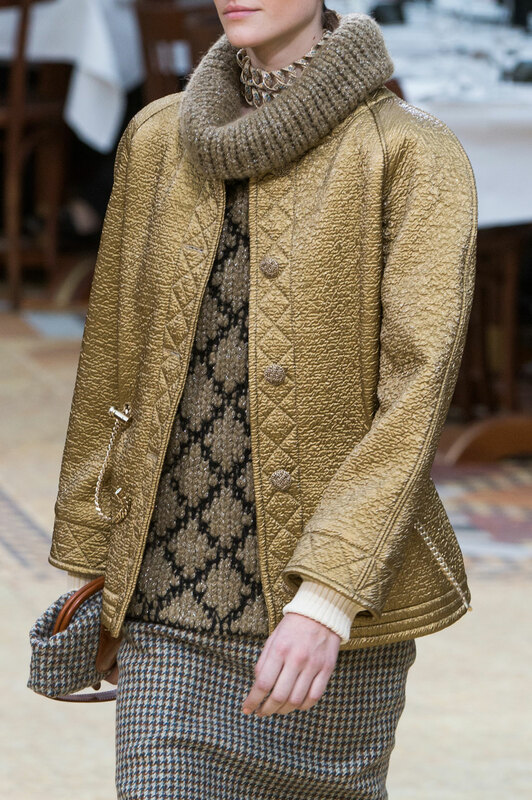 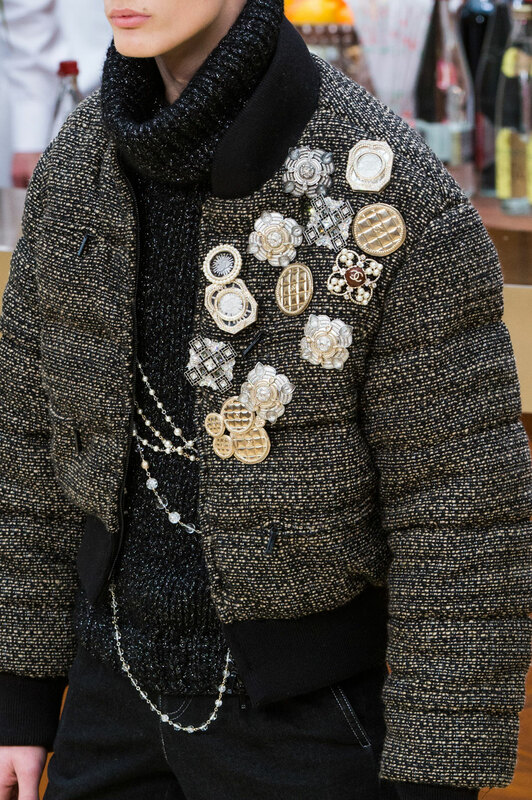 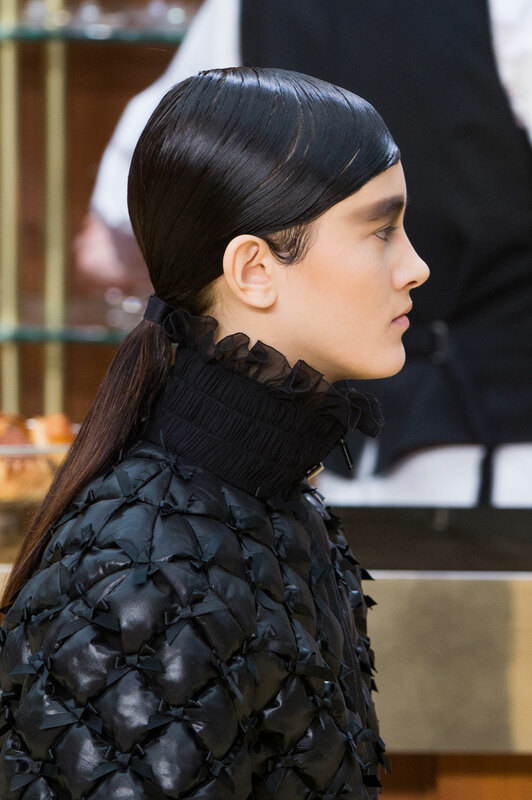 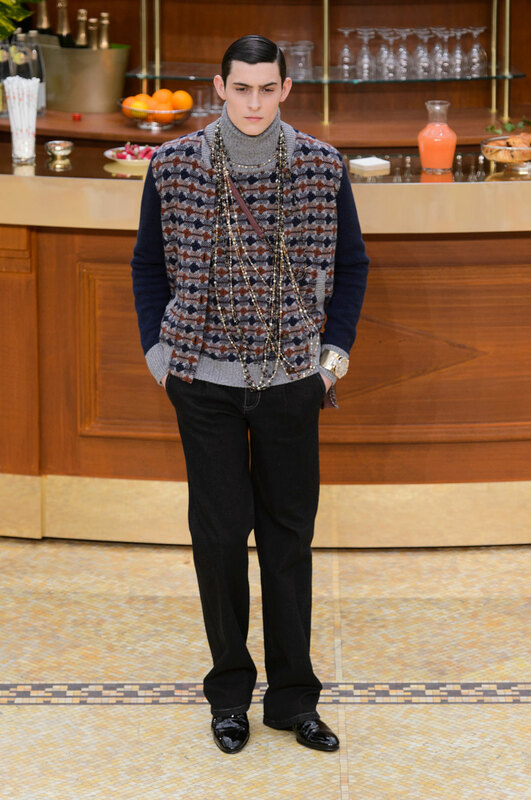 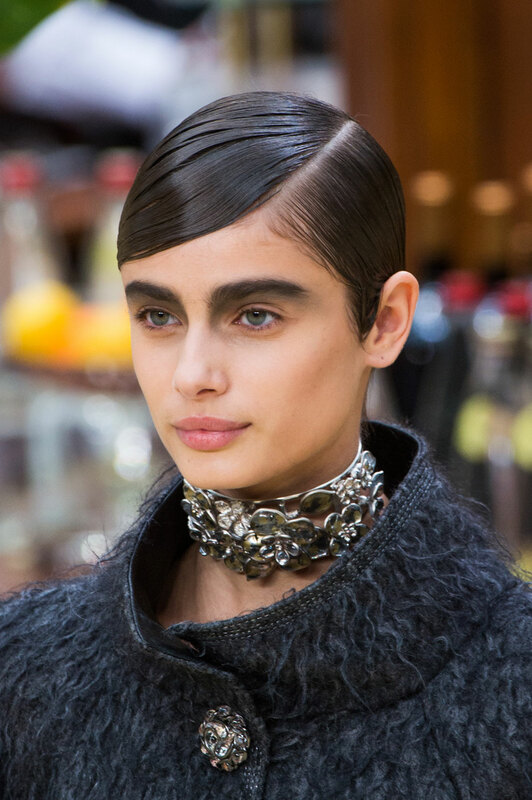 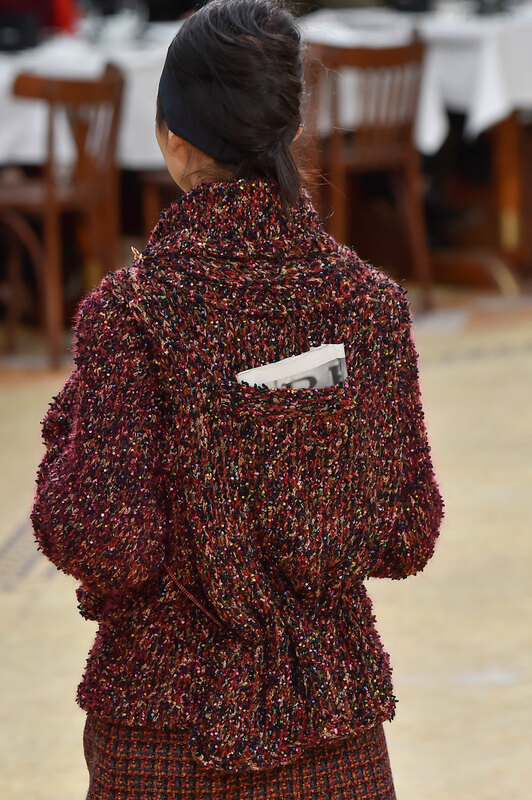 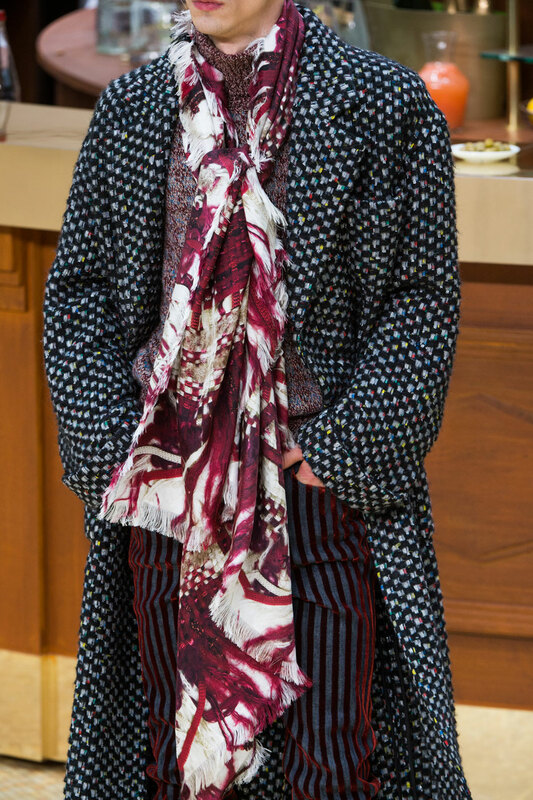 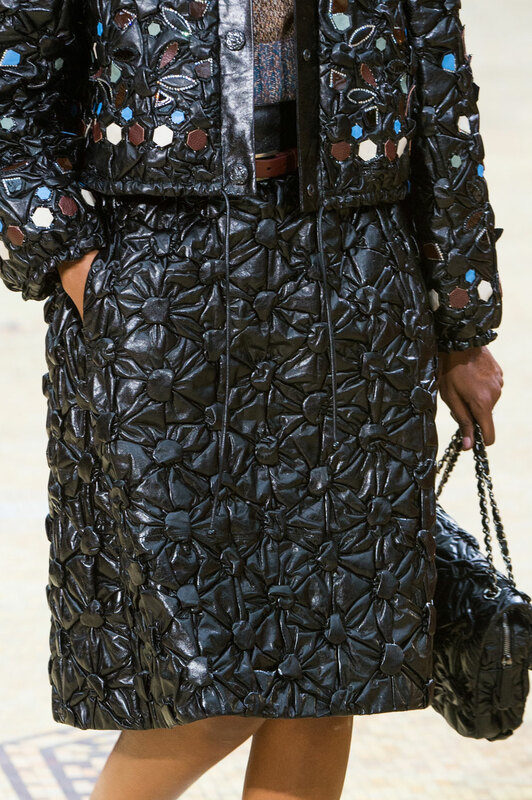 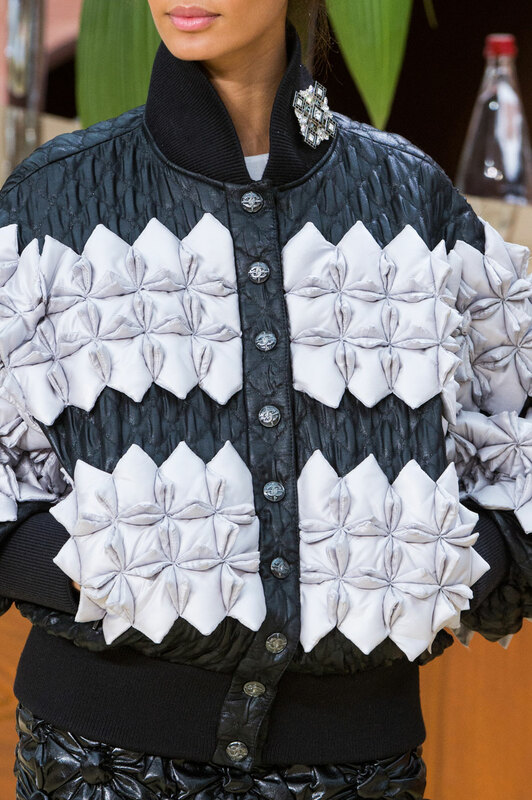 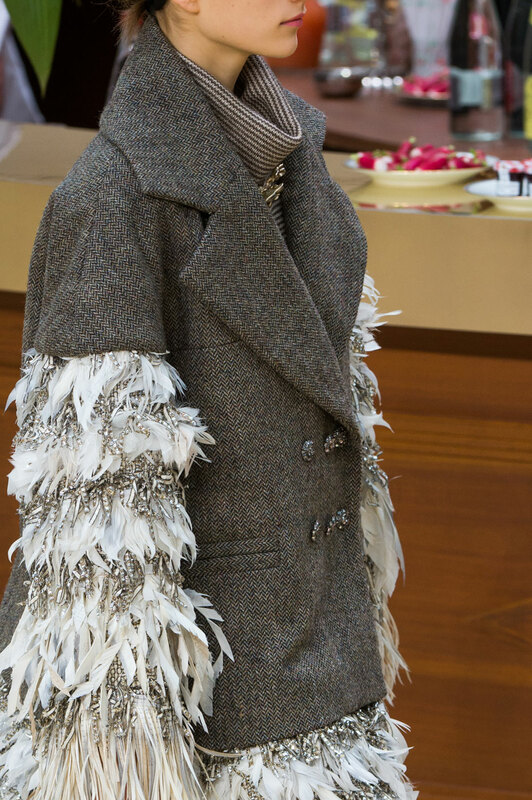 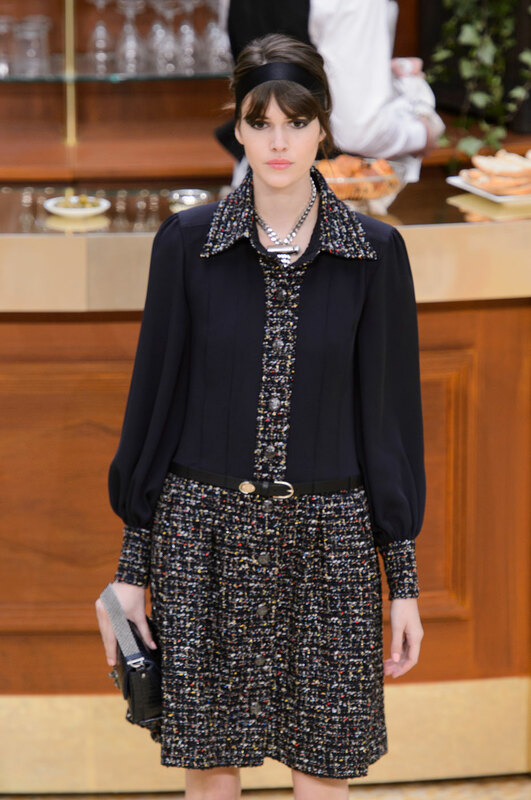 Chanel Autumn-Winter 2015 – This morning breakfast was being served at Brasserie Gabrielle, a giant Parisian eatery named after Coco Chanel, for the AW15 Chanel collection. 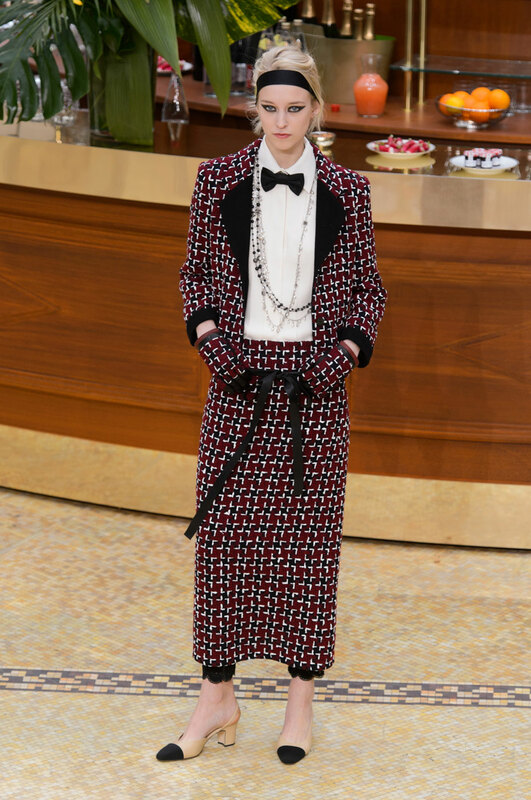 Karl Lagerfeld has no bounds when putting a show together and took it to the next level with his high fashion café. 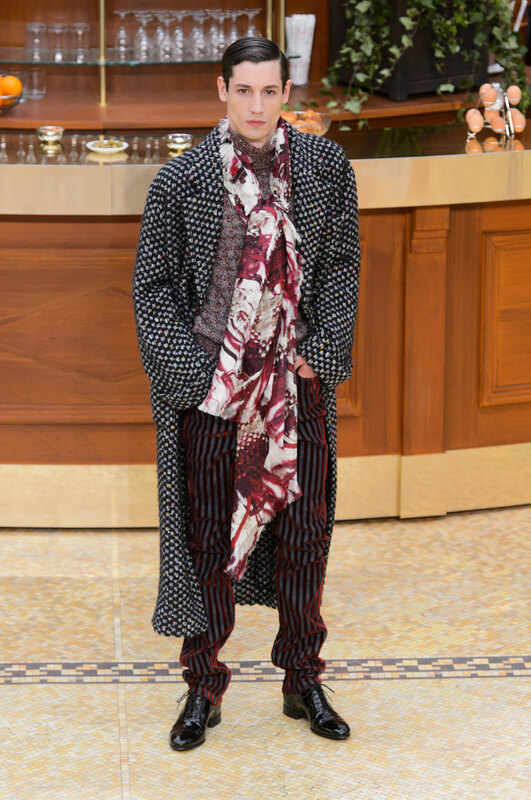 Lagerfeld had a full, functioning restaurant at the Grand Palais. 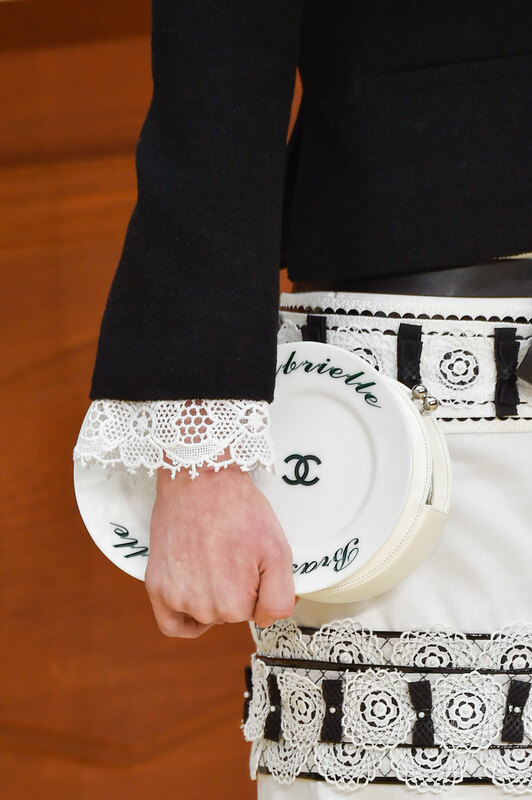 The show came complete with bartenders, fruit bowls, and café-au-lait. 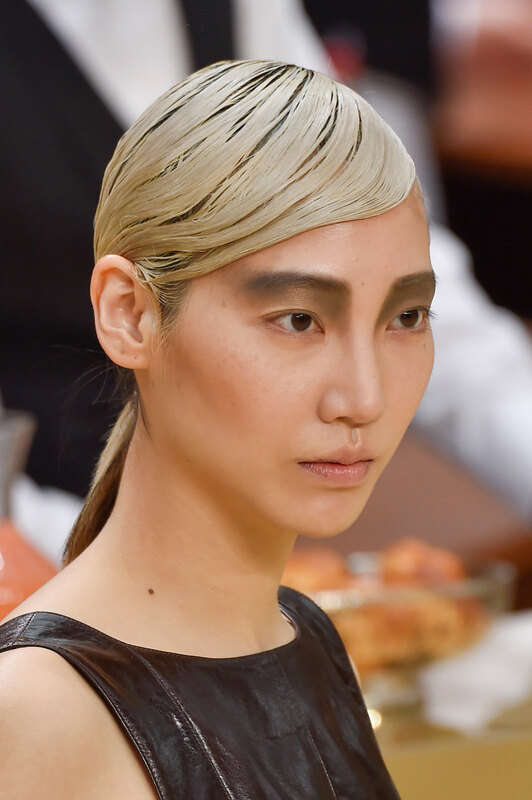 Models walked the runway, and then found a seat at one of the tables. 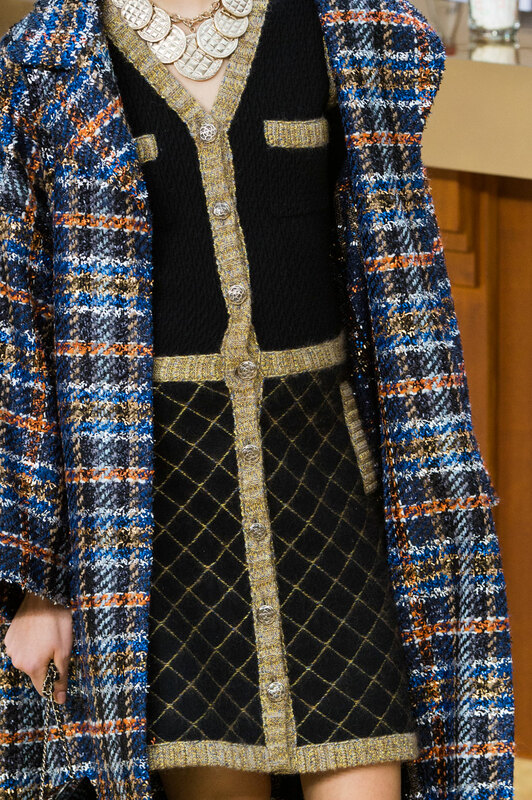 There was a distinct 60s feel to the collection, with multi-coloured chevron-print fine knits, as well as monochrome baby doll dresses and low square-heeled shoes. 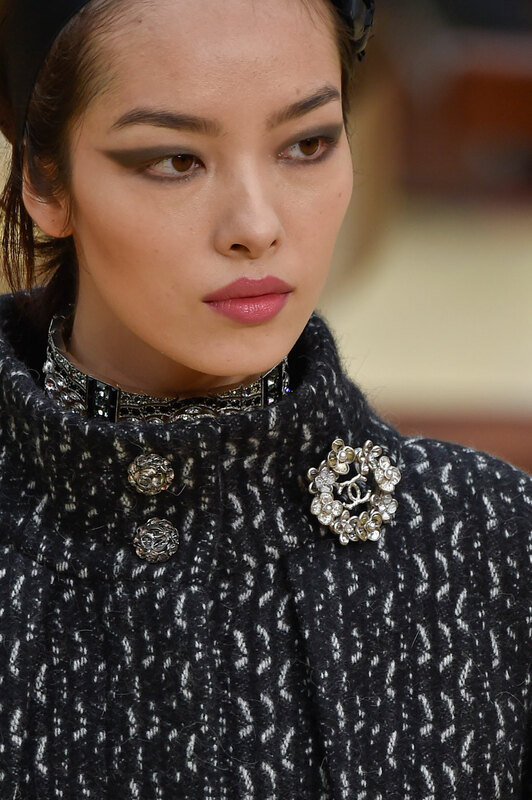 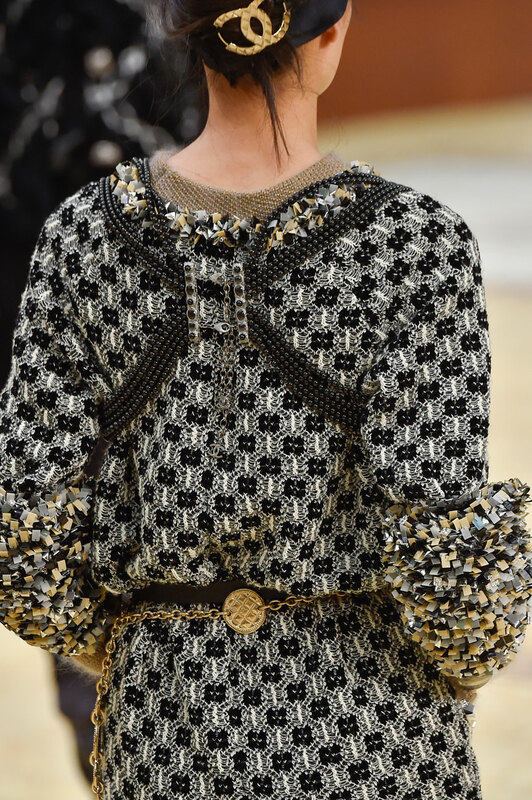 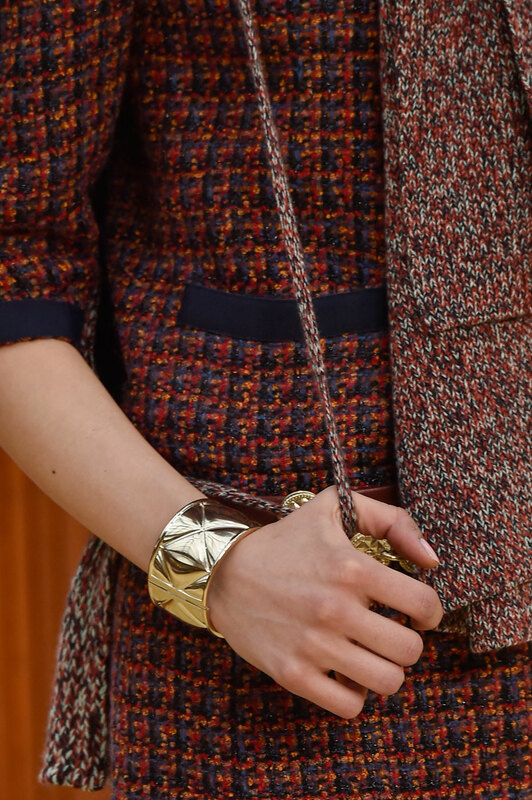 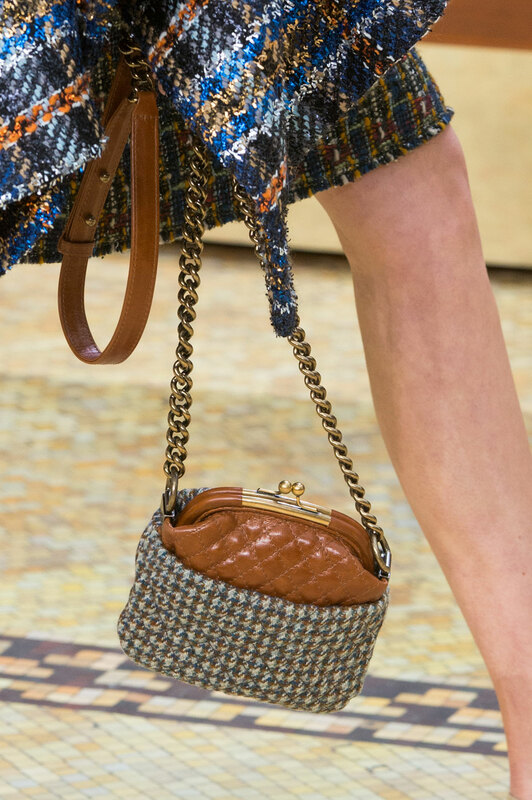 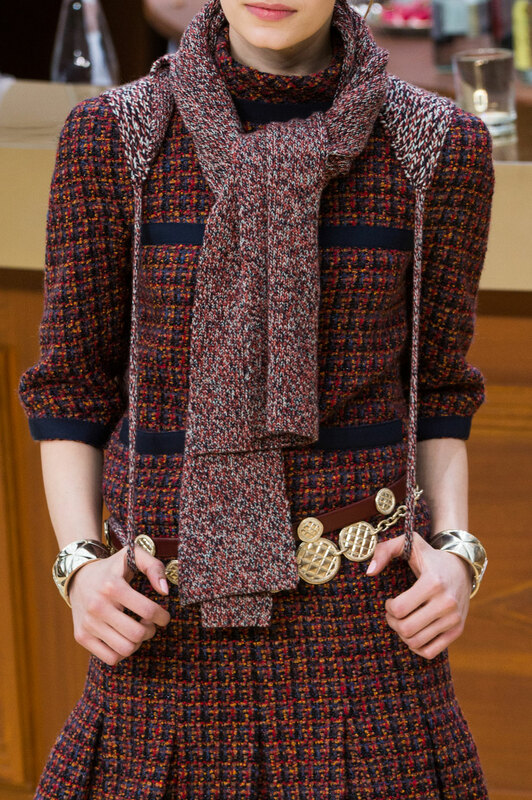 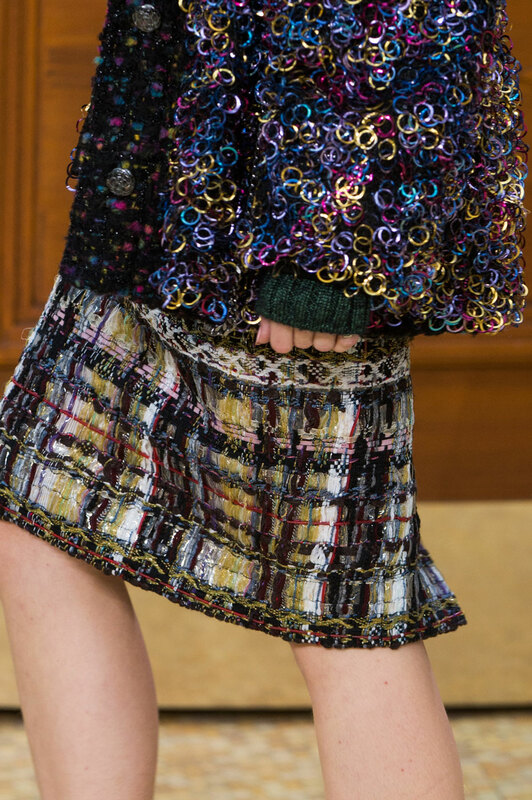 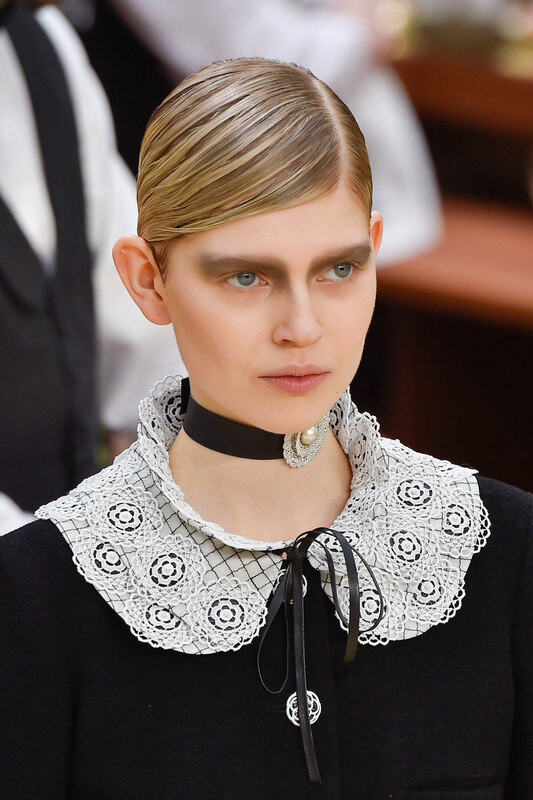 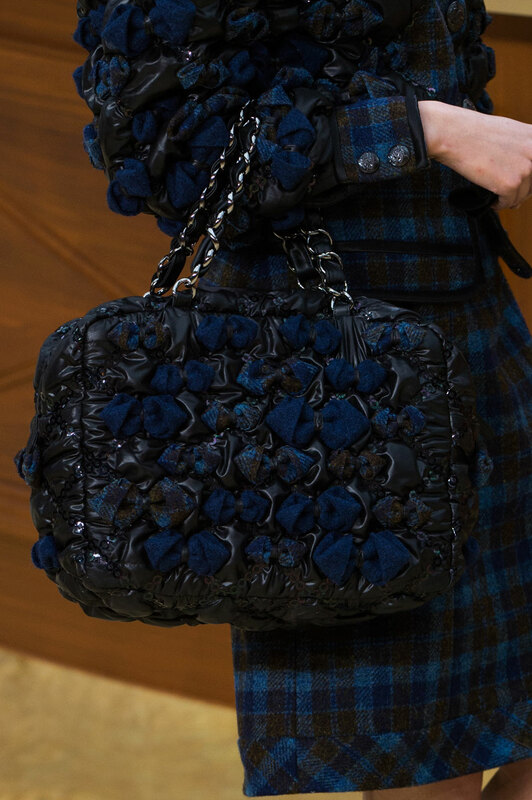 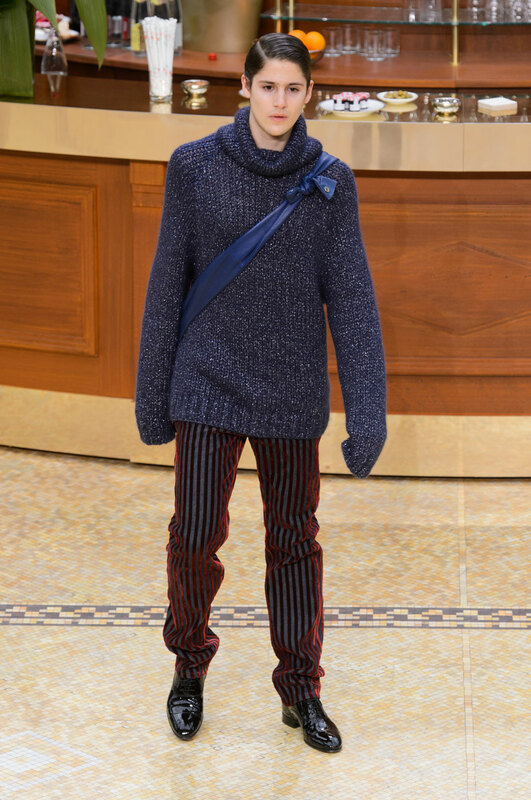 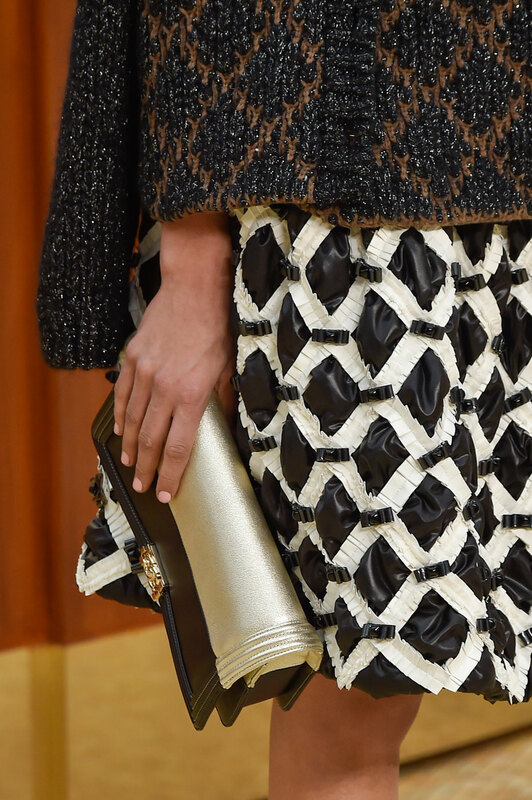 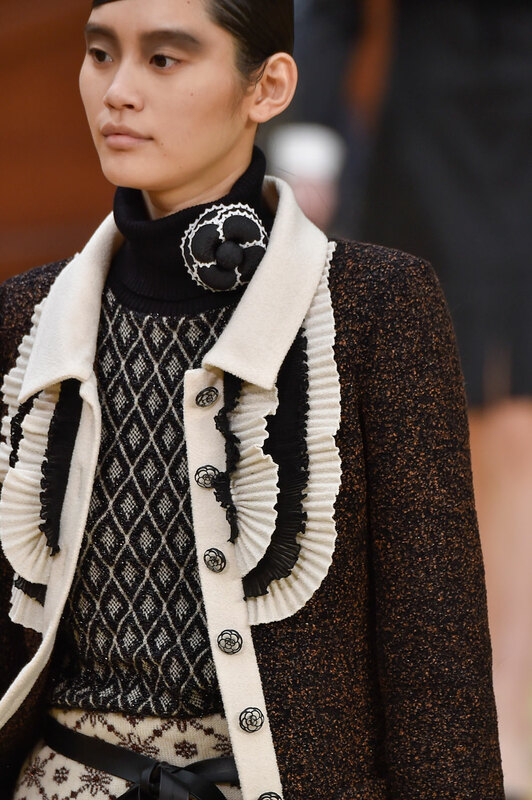 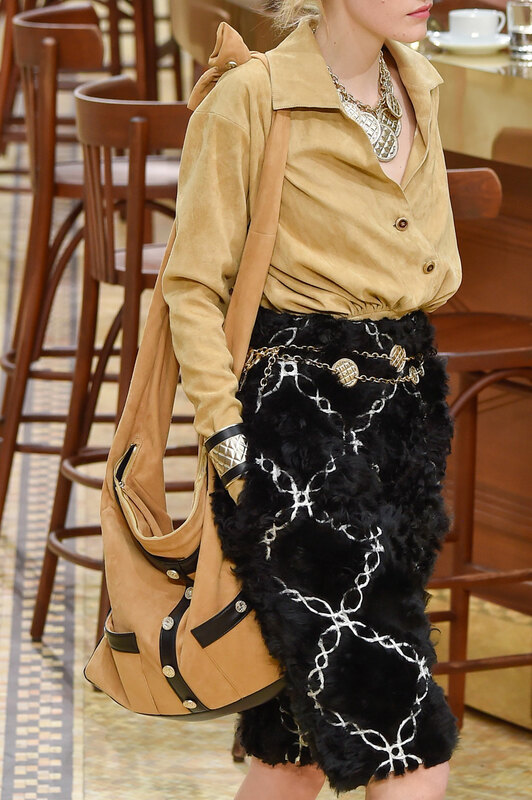 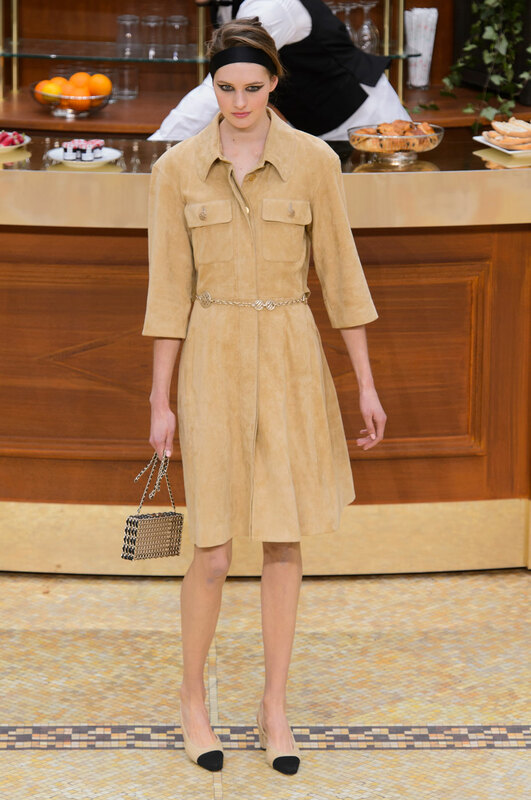 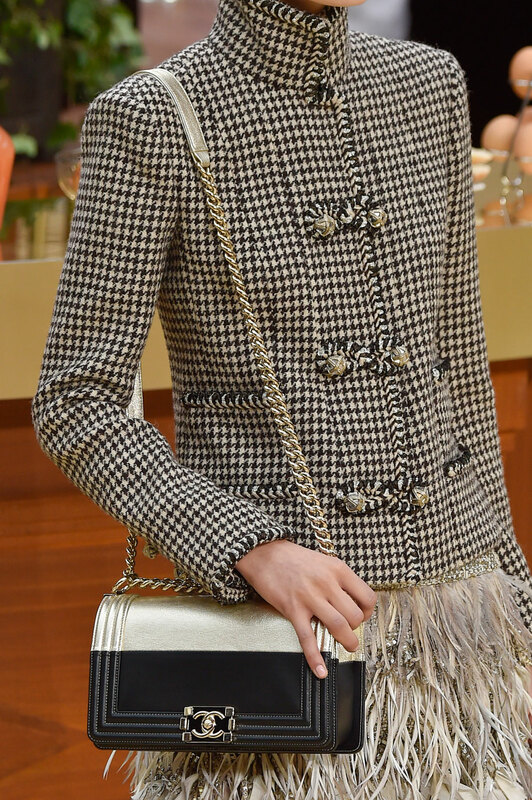 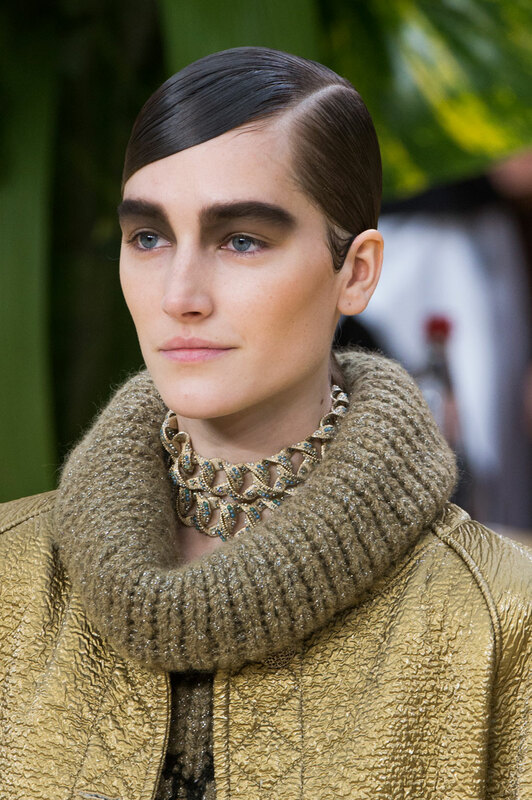 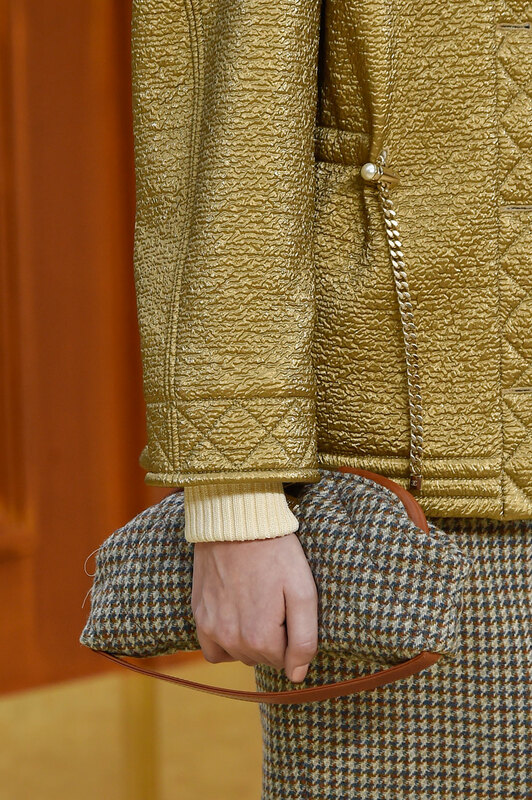 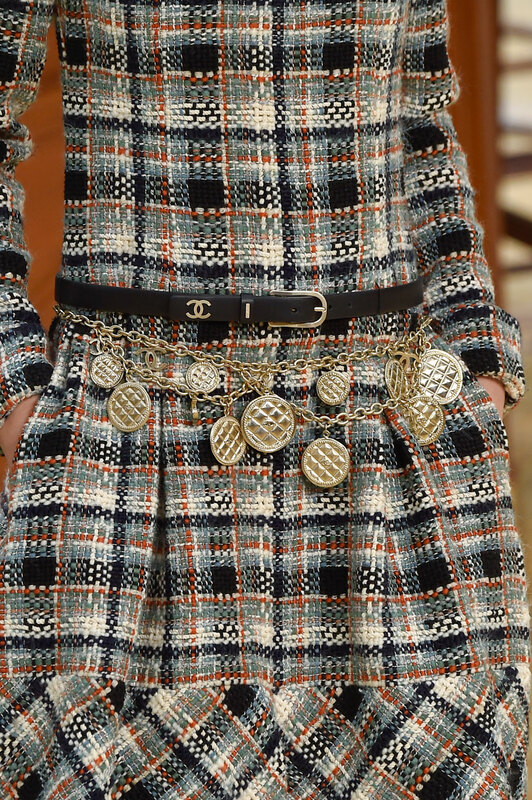 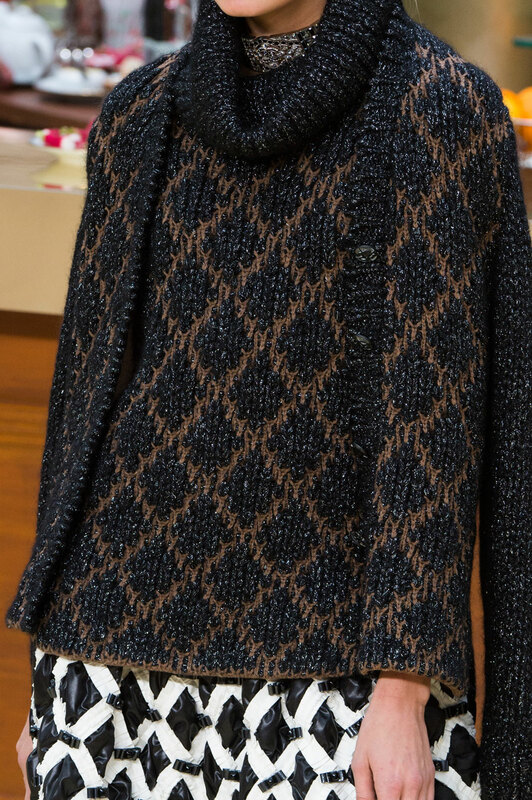 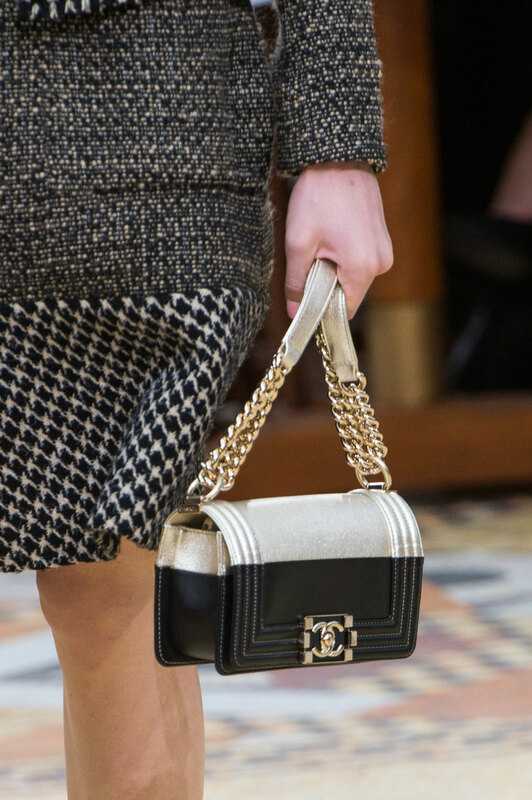 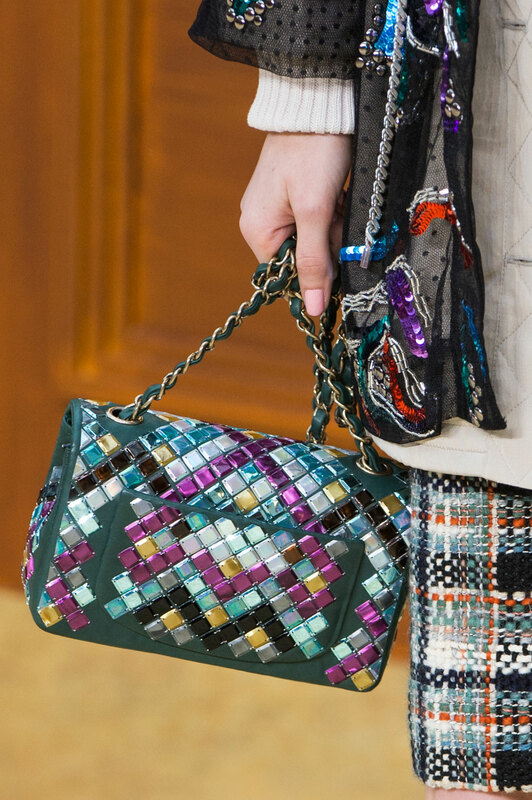 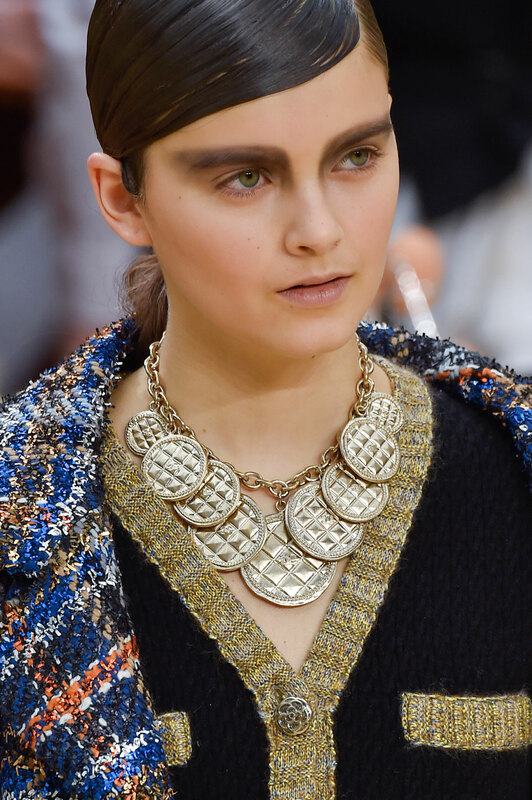 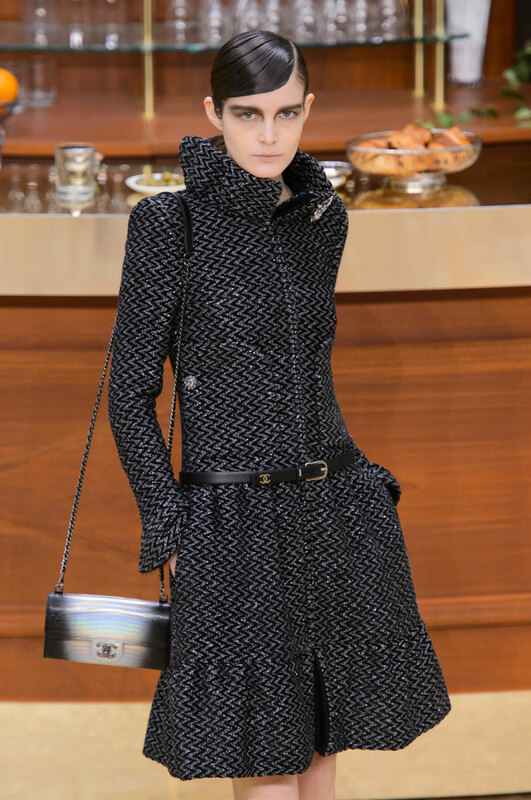 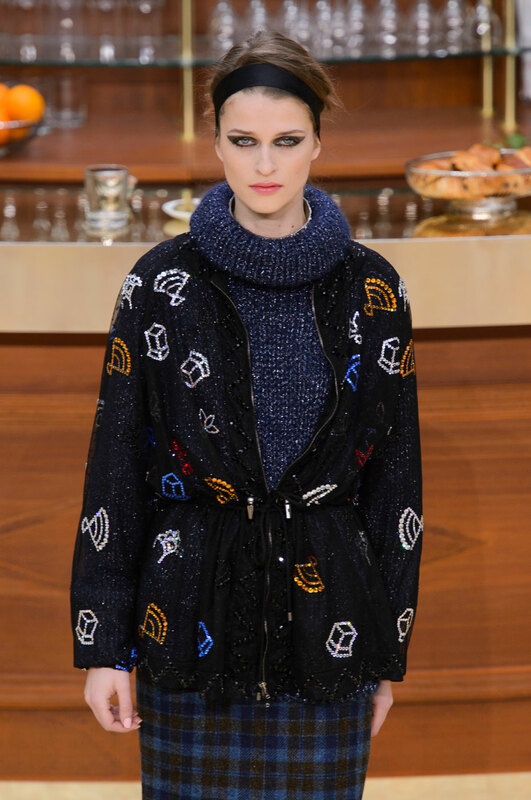 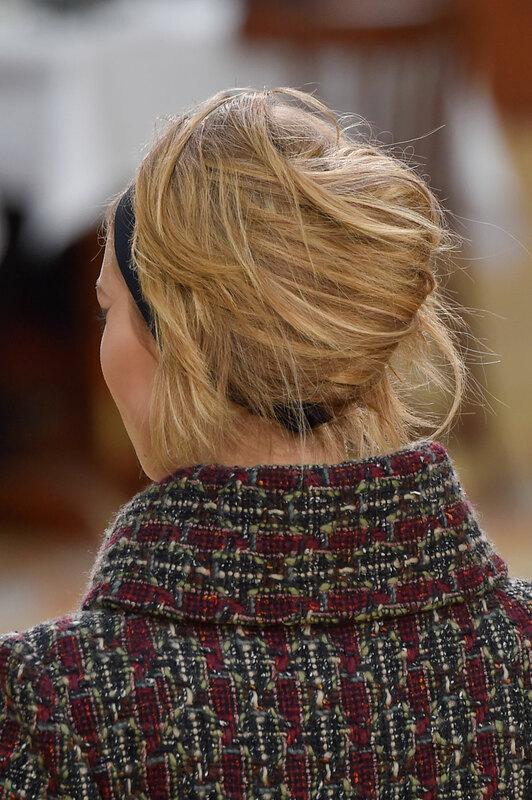 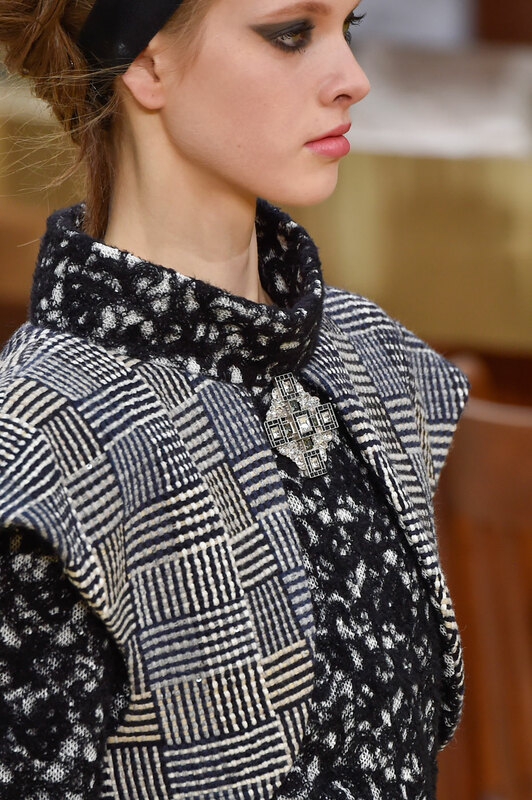 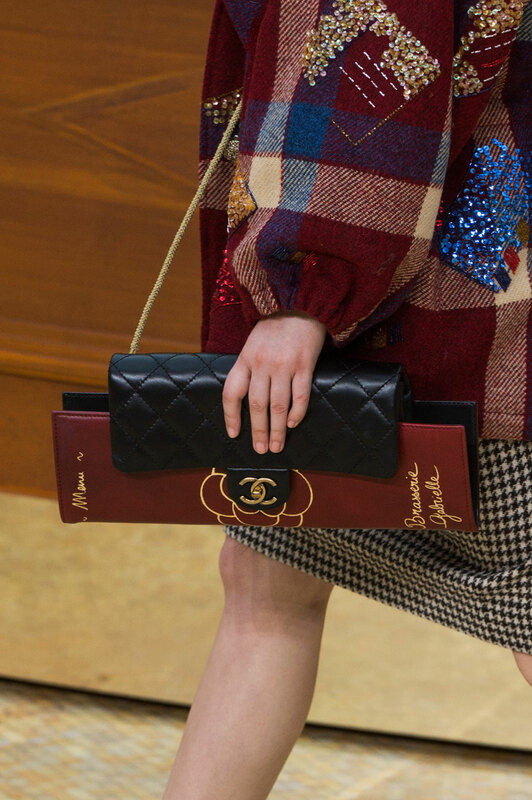 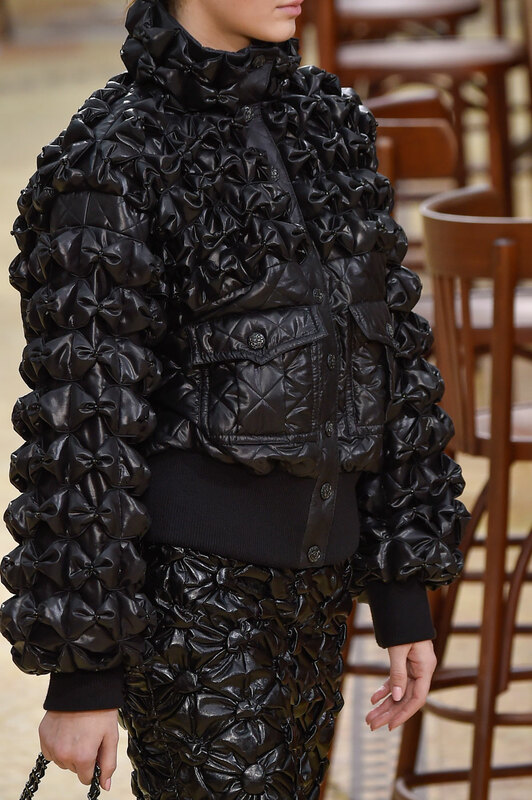 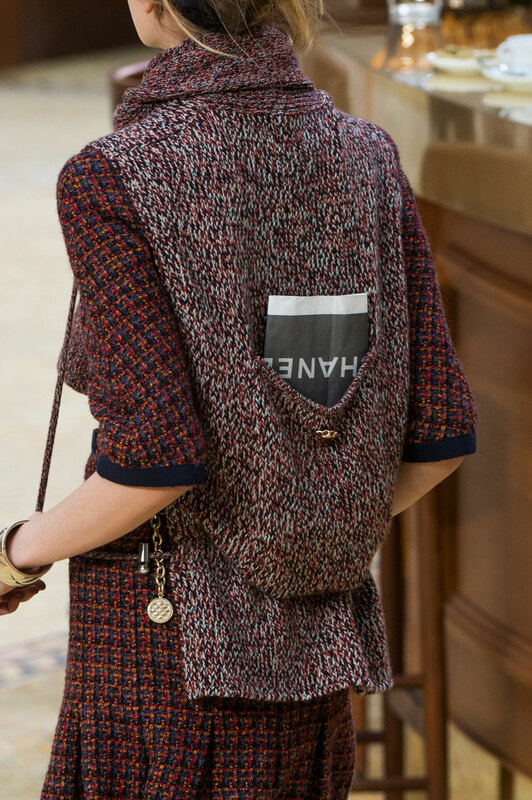 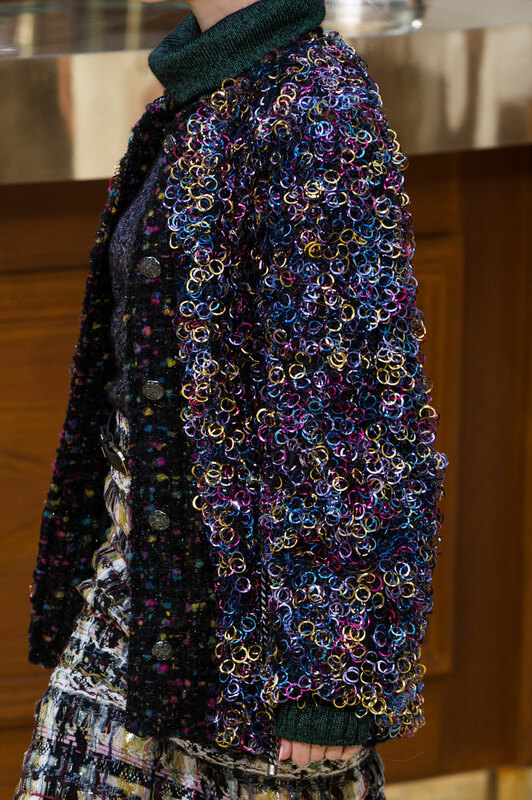 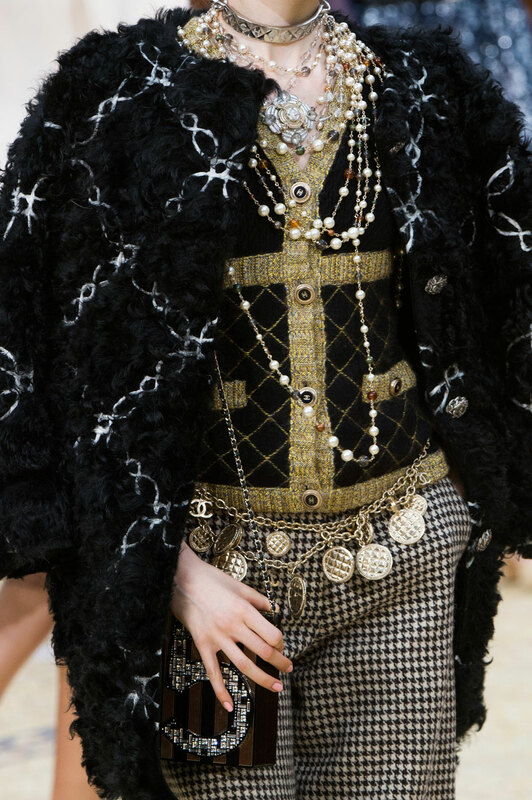 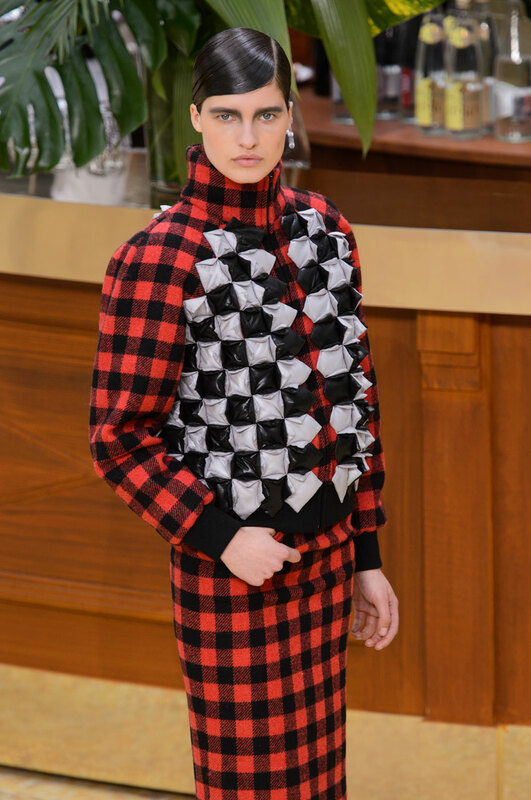 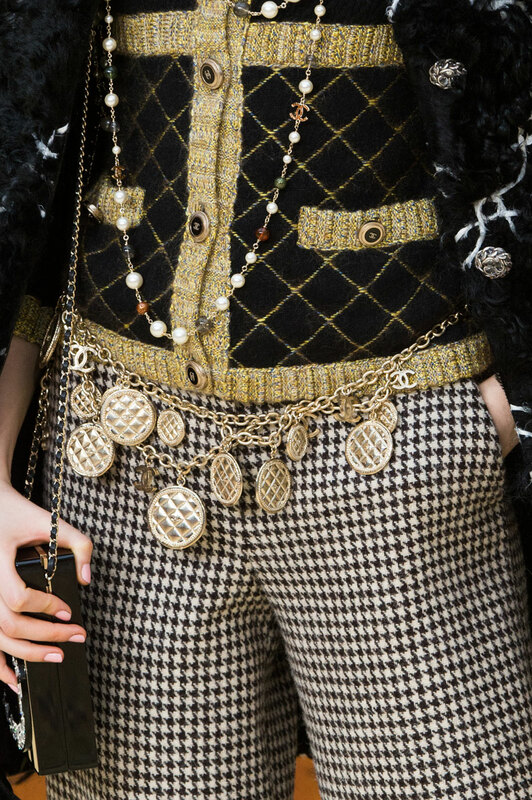 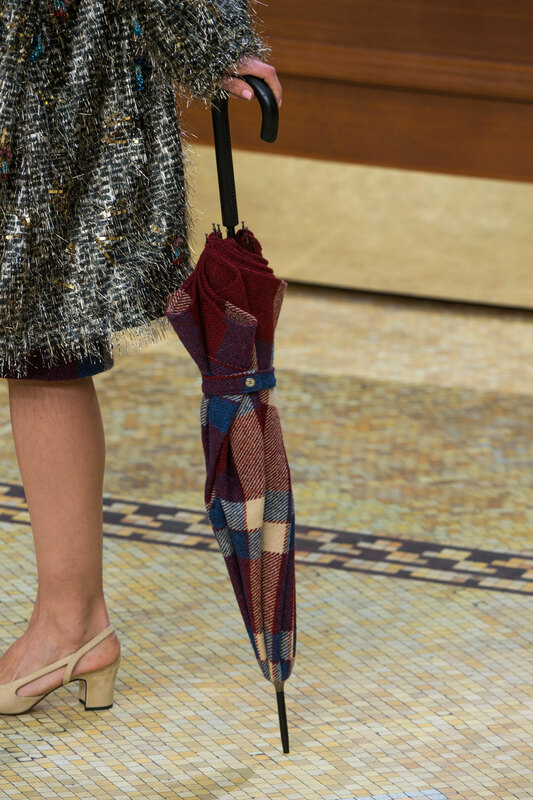 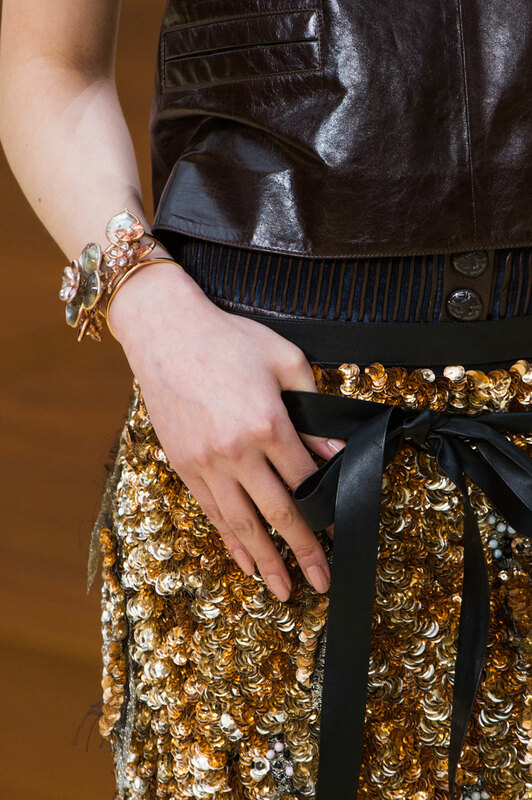 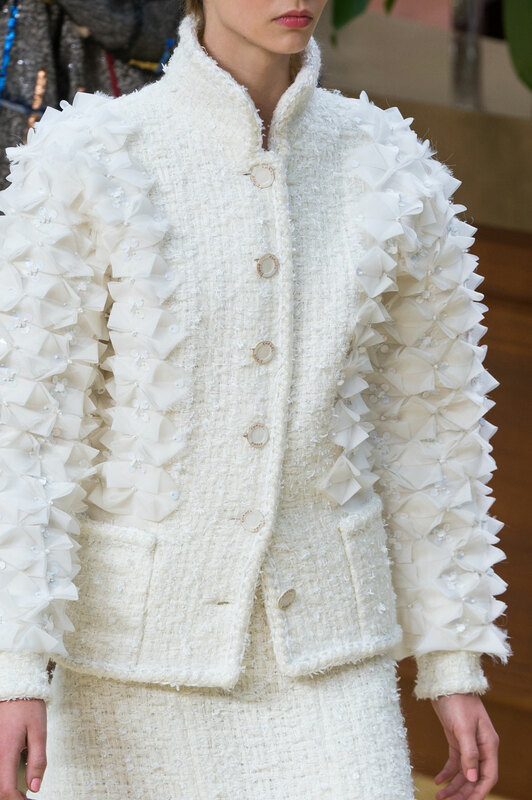 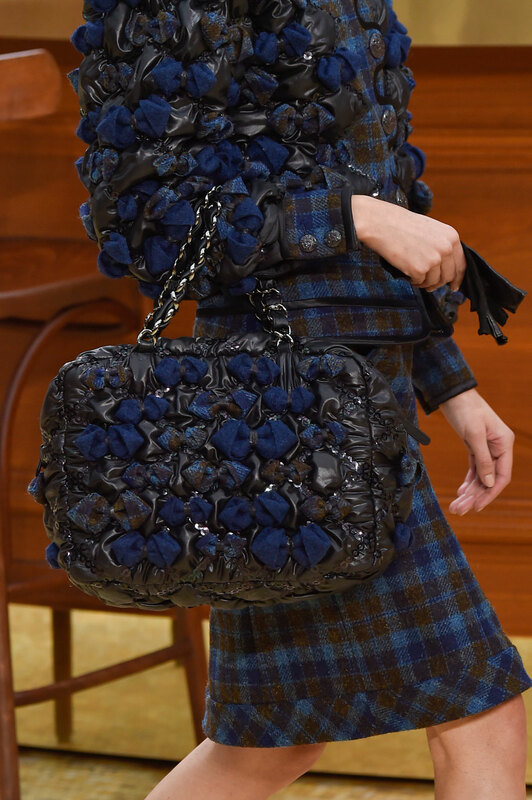 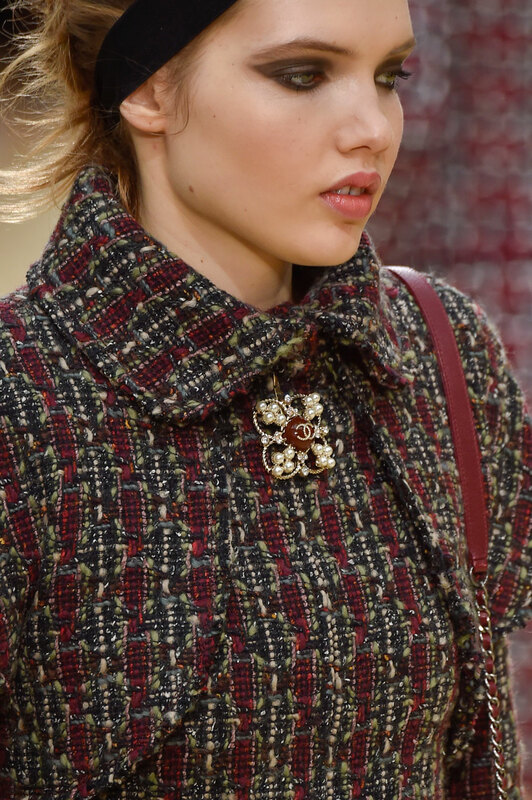 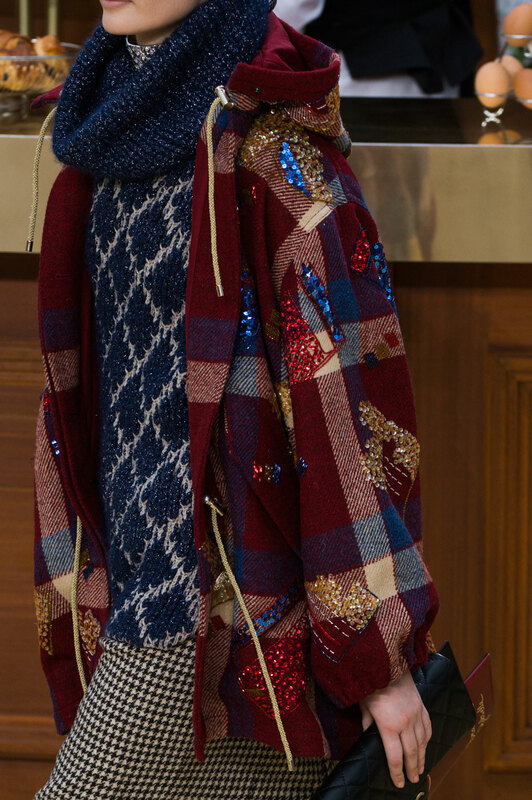 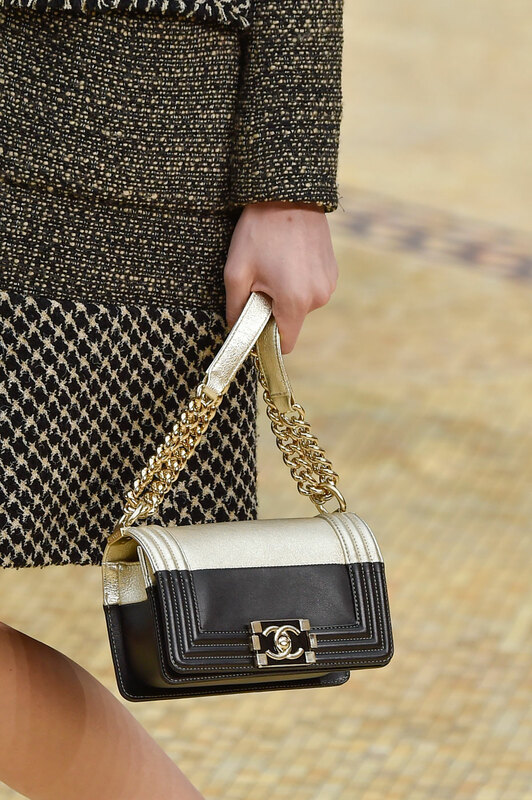 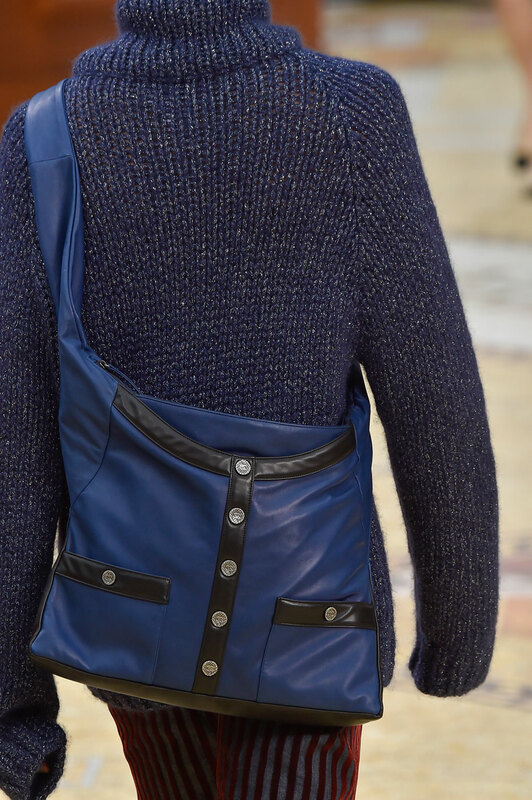 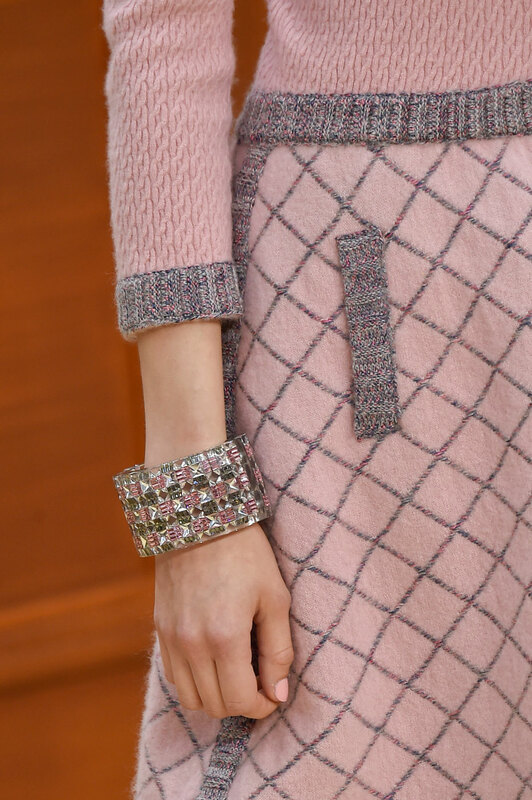 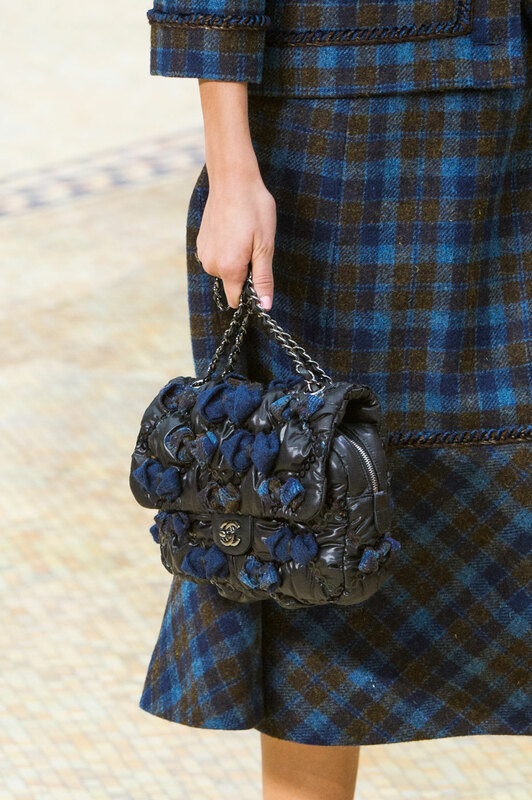 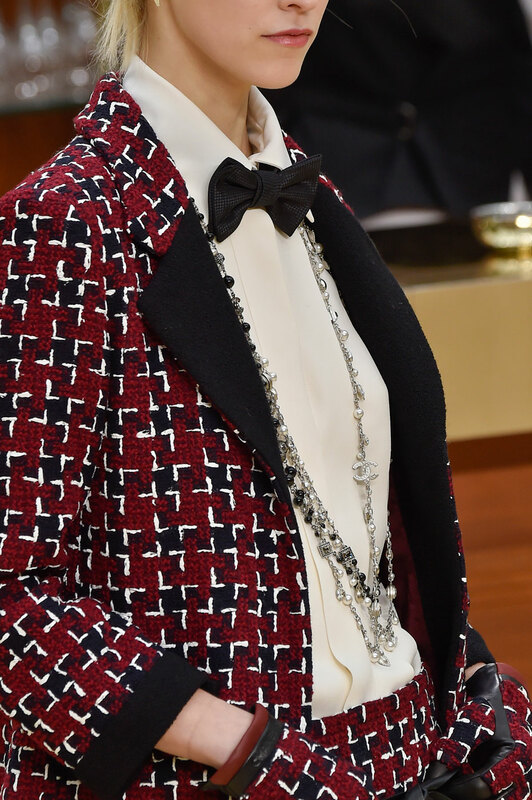 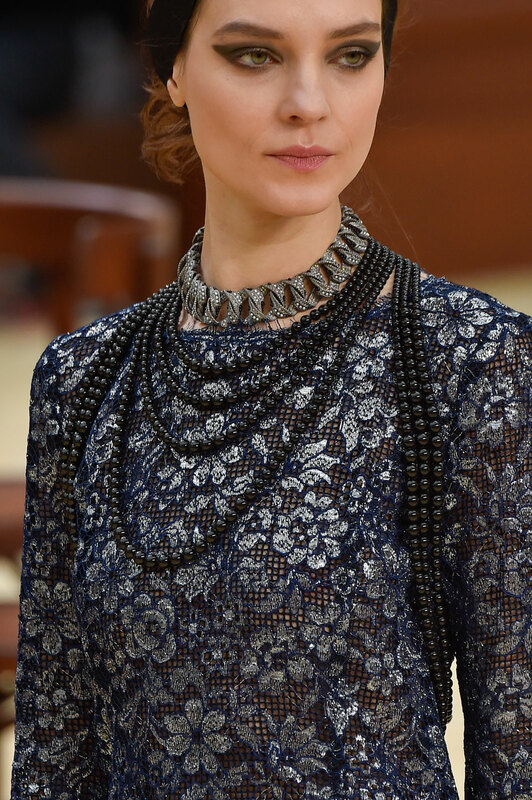 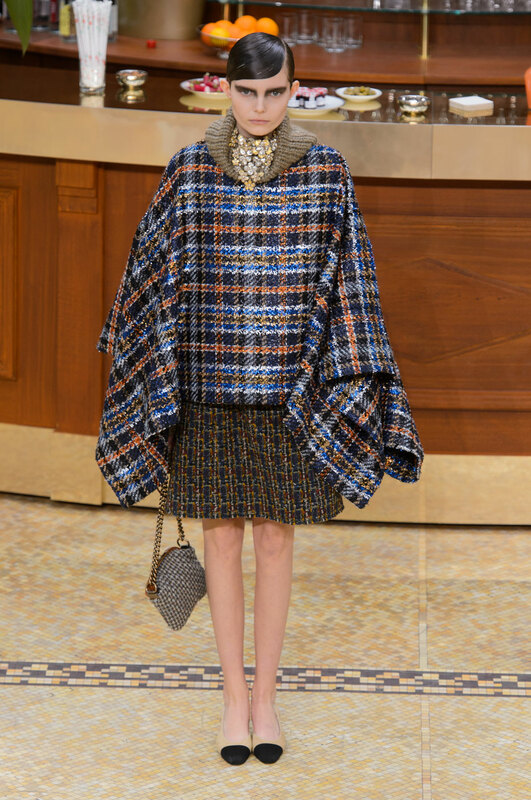 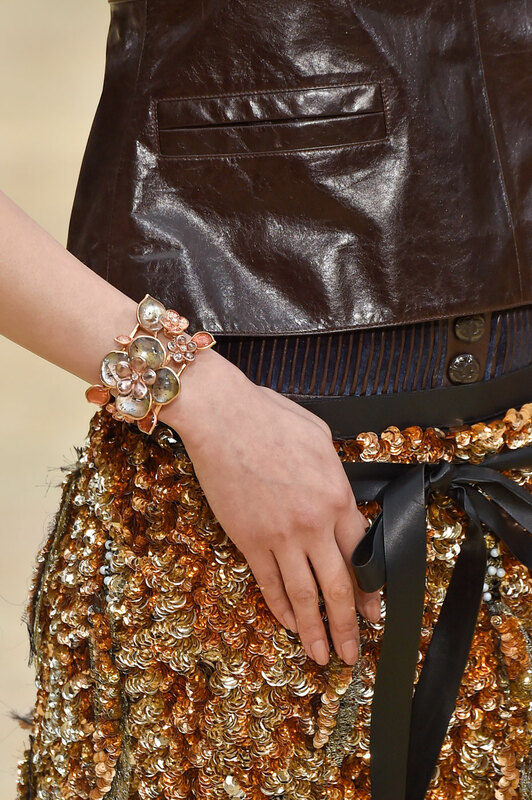 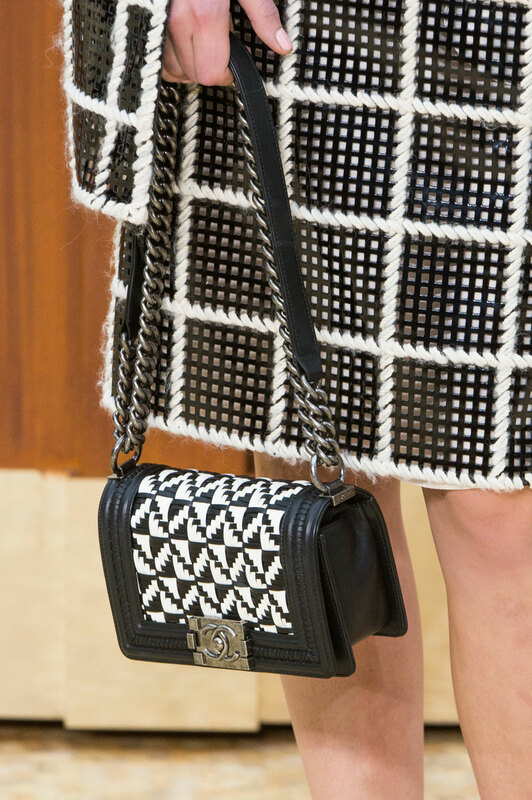 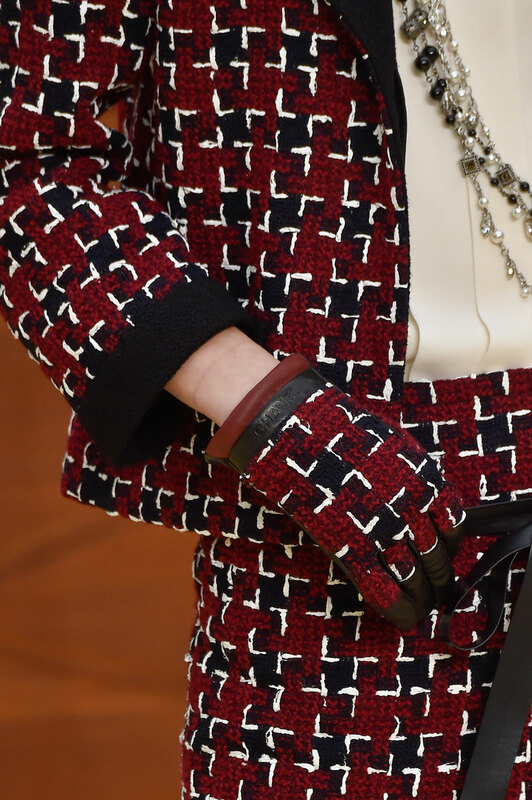 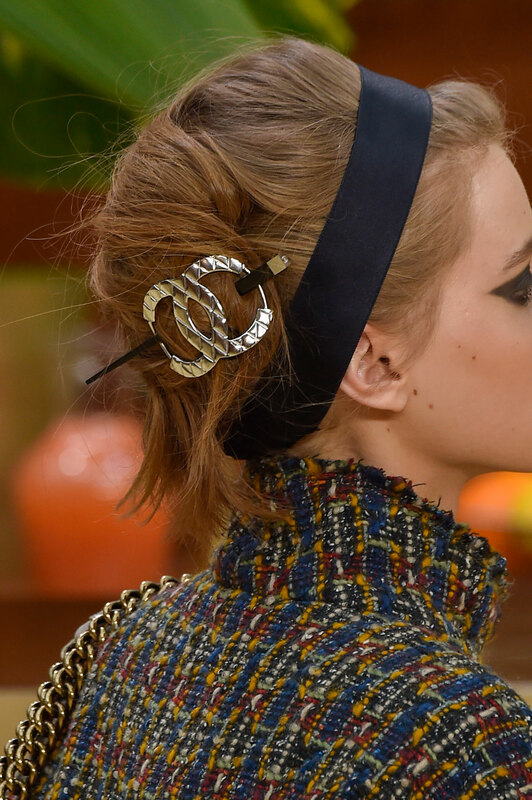 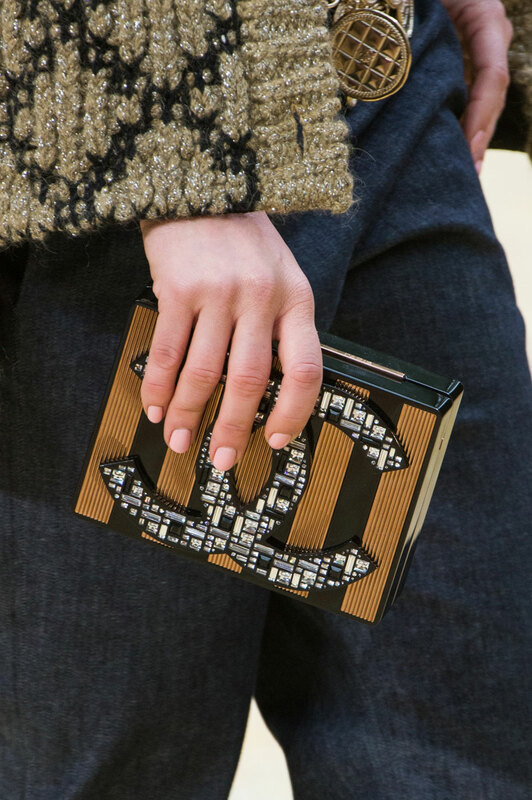 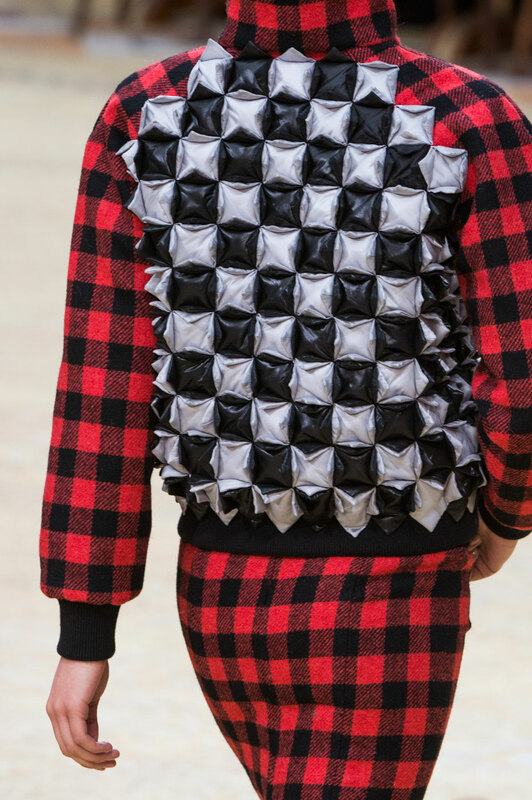 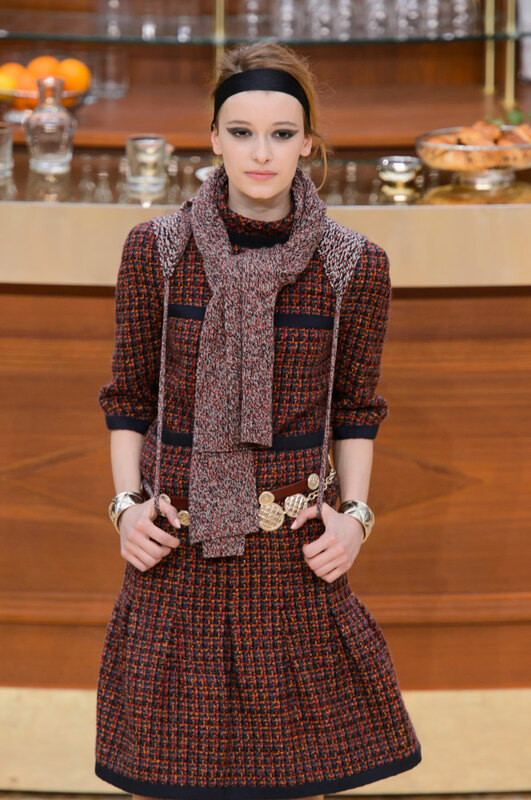 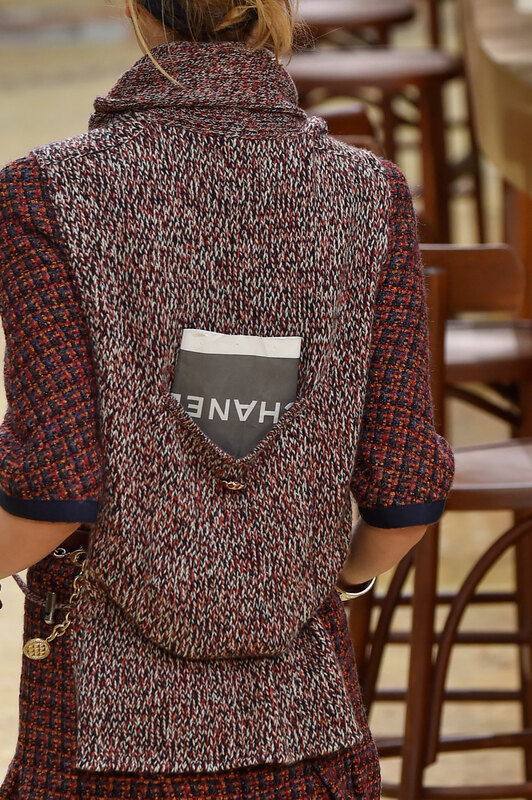 This season Chanel classics were revamped and modernised. 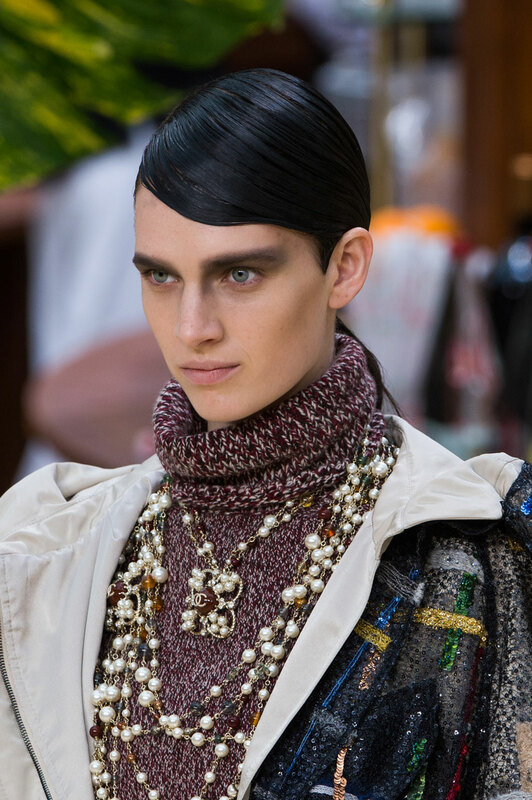 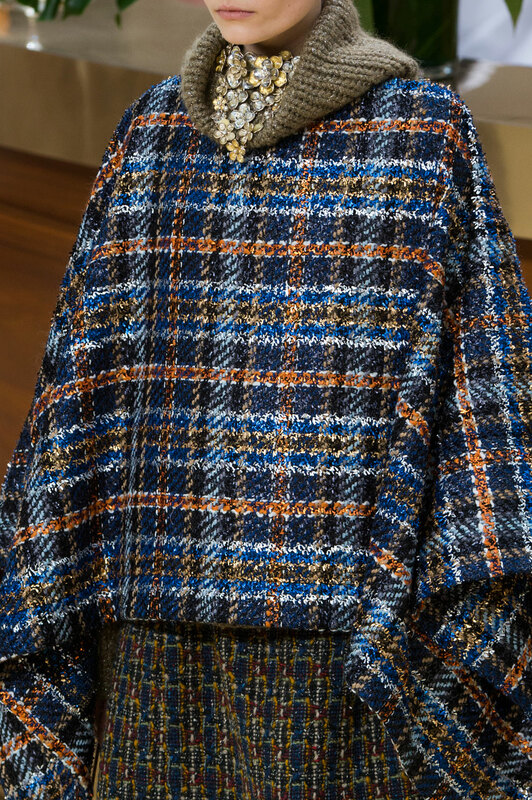 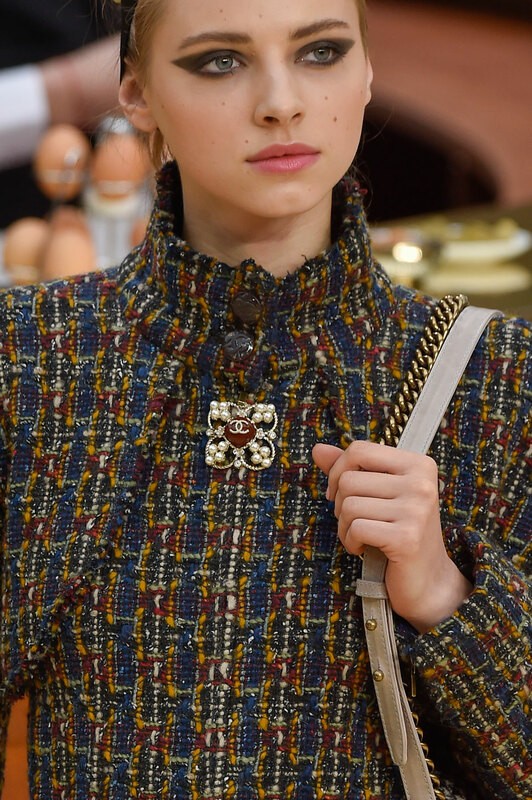 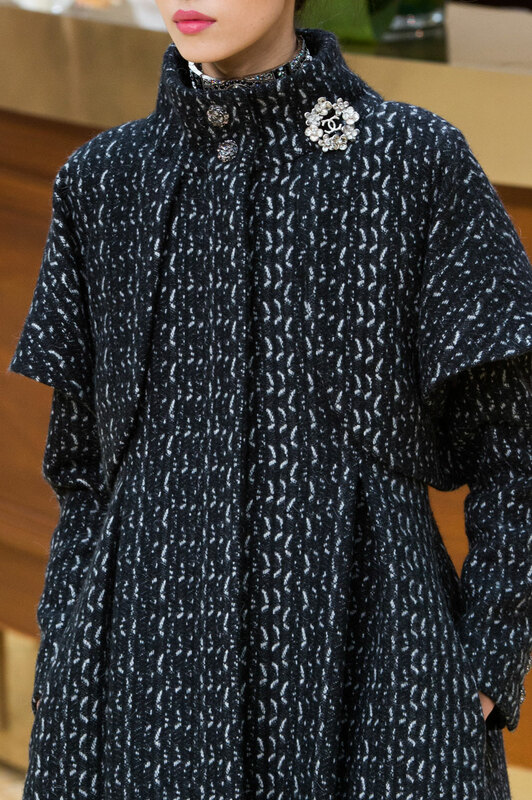 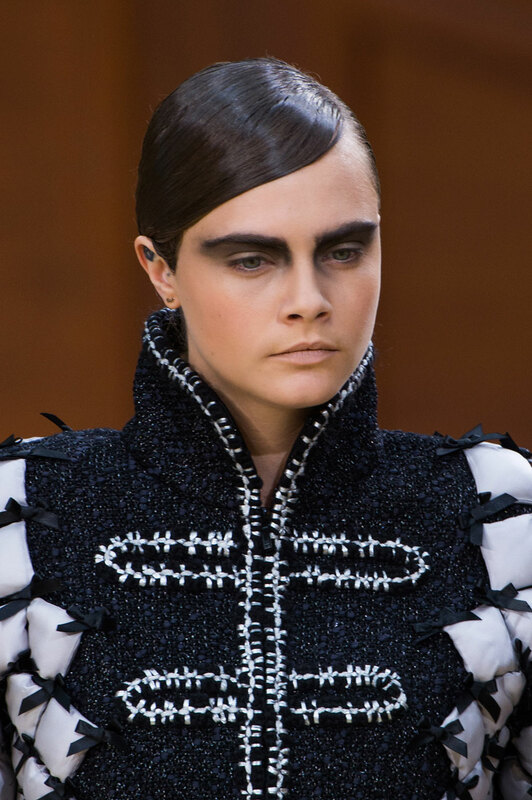 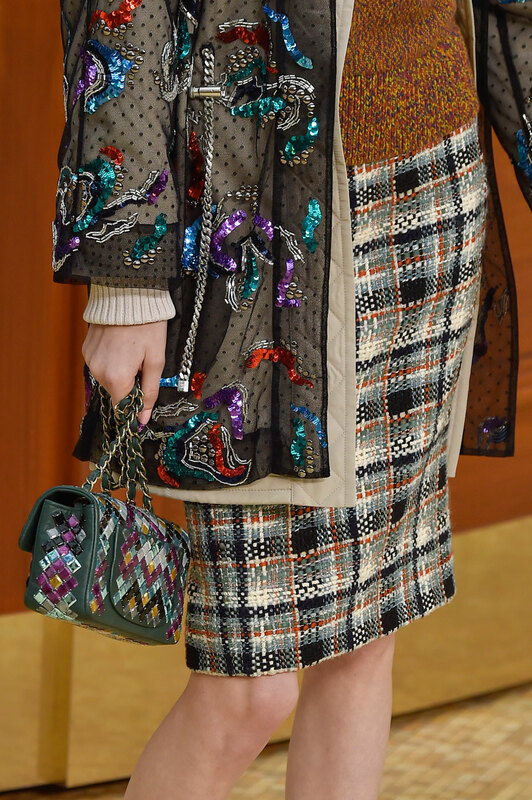 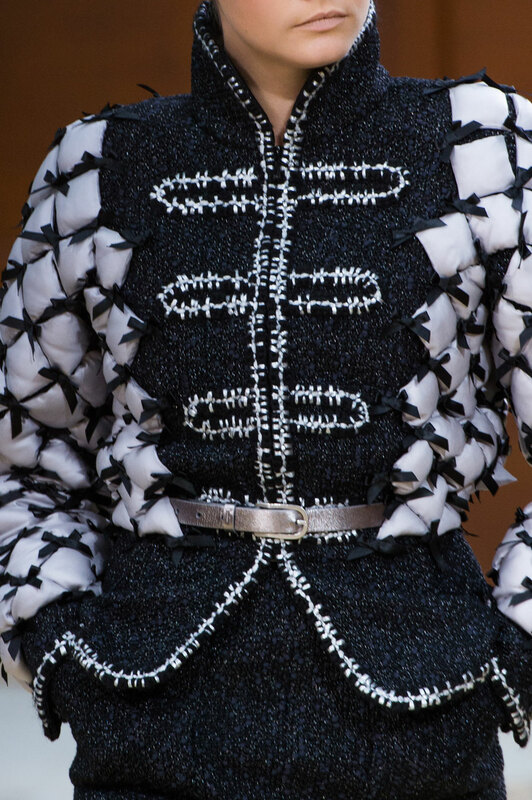 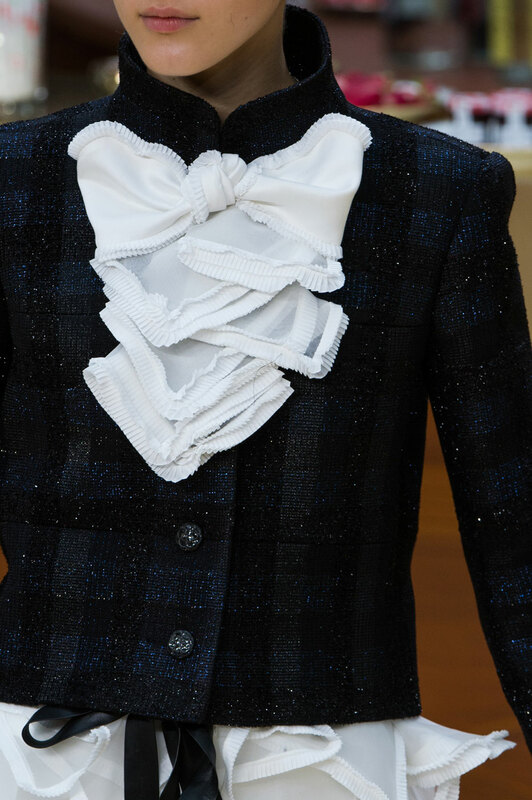 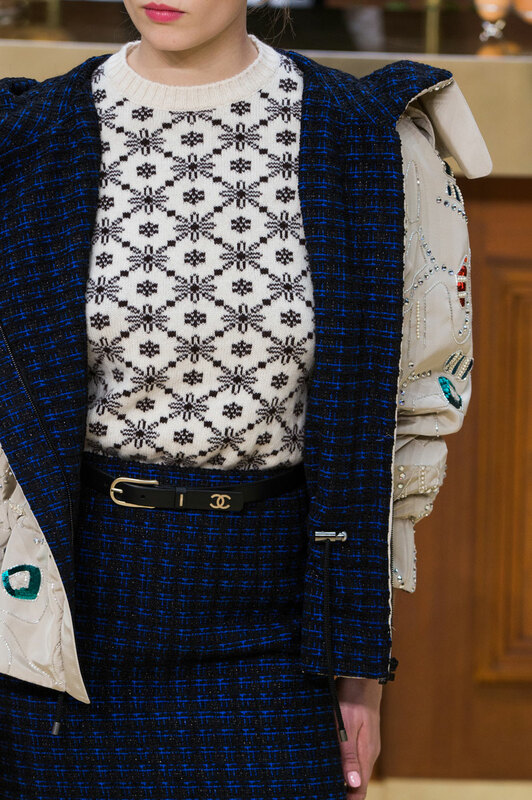 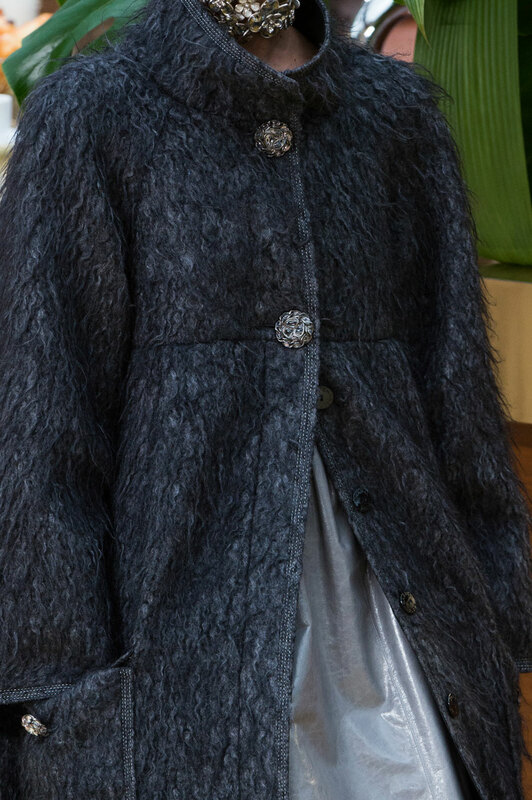 The classic tweed jacket got reworked into the form of tweed parkas and a monochrome structured blazed whilst traditional tweed looks came complete with cute bow tie accessories and strings of the classic Chanel pearls. 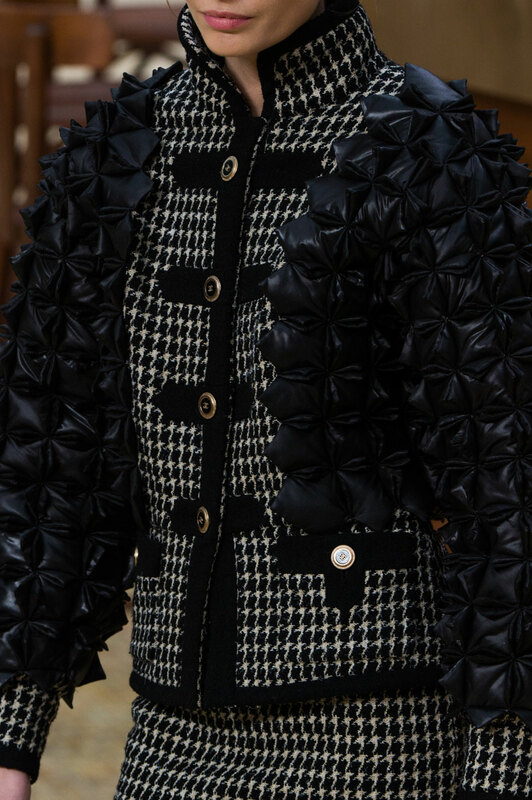 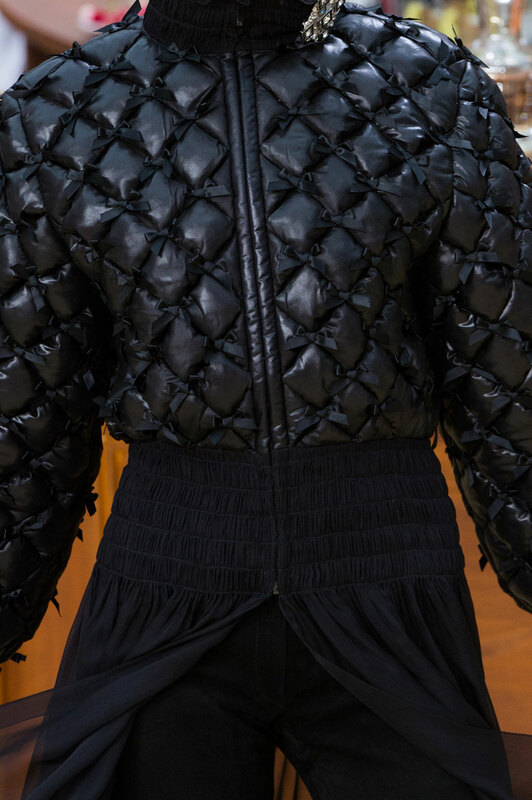 The iconic skirt suit was transformed into texture bomber jackets teamed with matching shiny black pencil skirts. 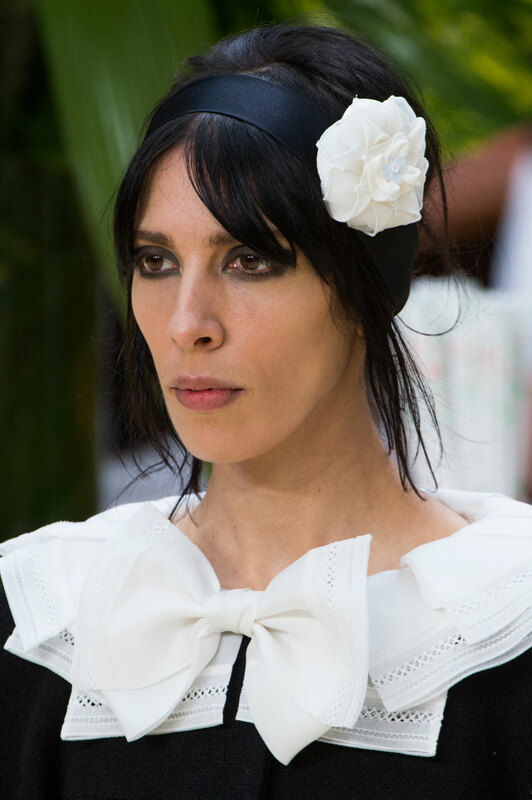 The French fashion house’s iconic Little Black Dress became a sheer 60s baby doll style dress in a variation of forms. 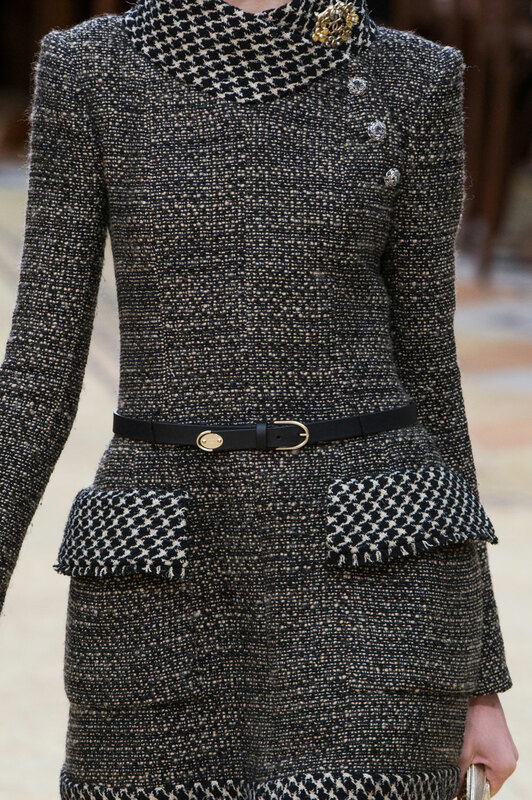 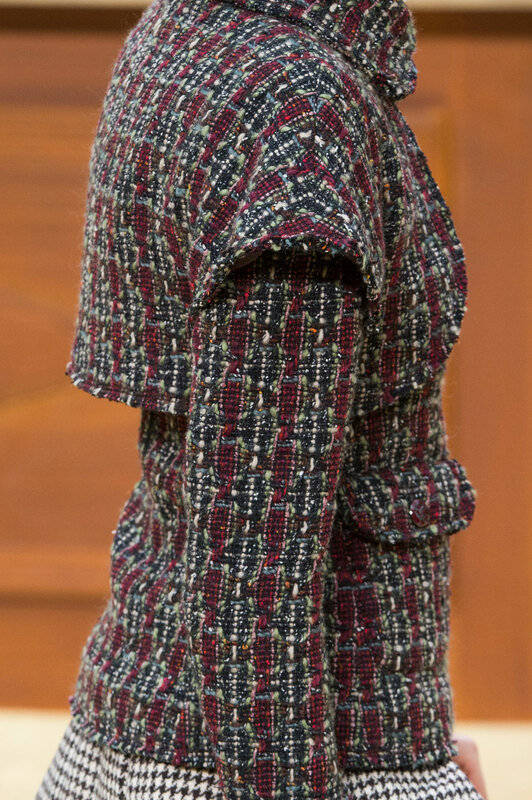 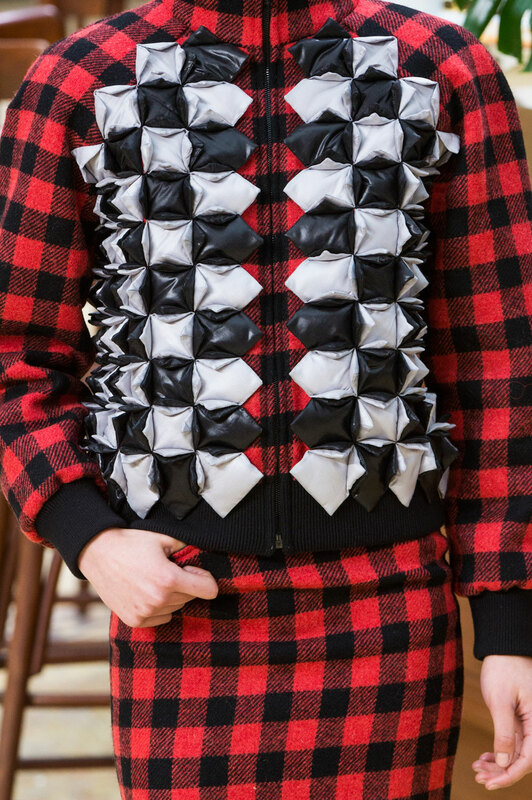 With collars, piping, detailed neckline and capped sleeves added elegance to the collection. 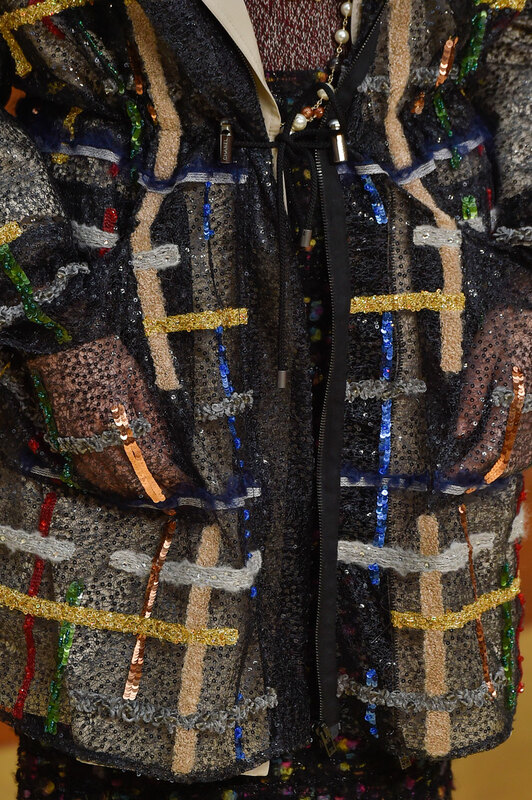 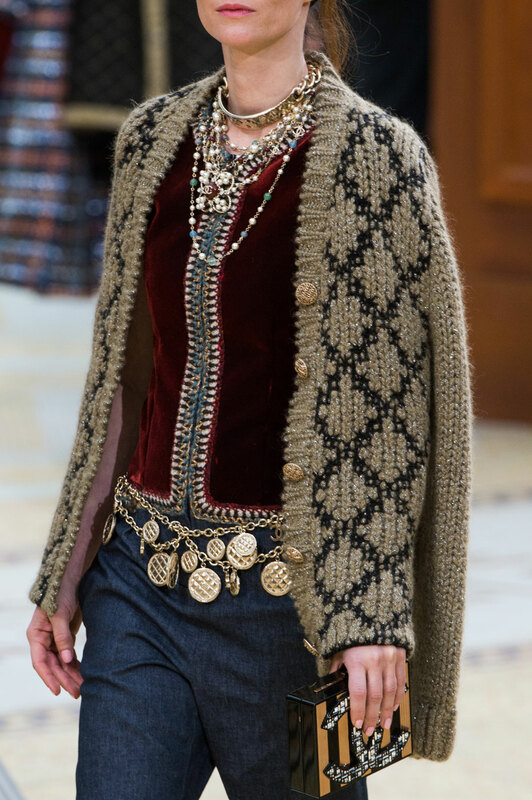 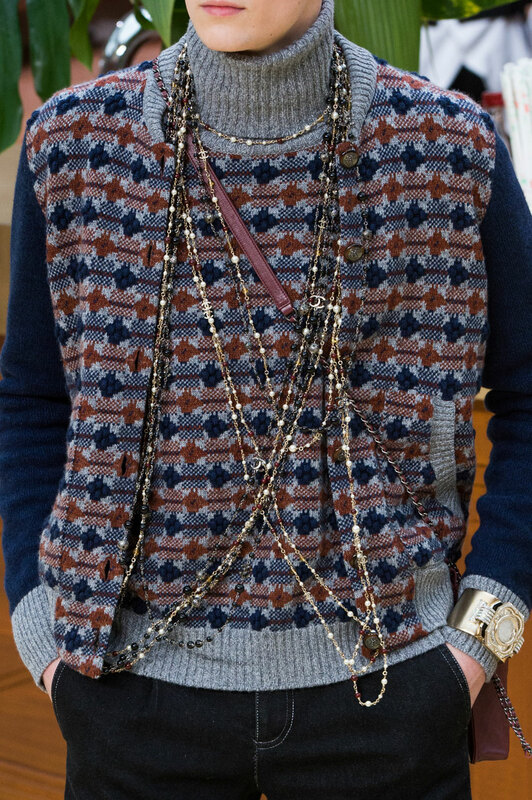 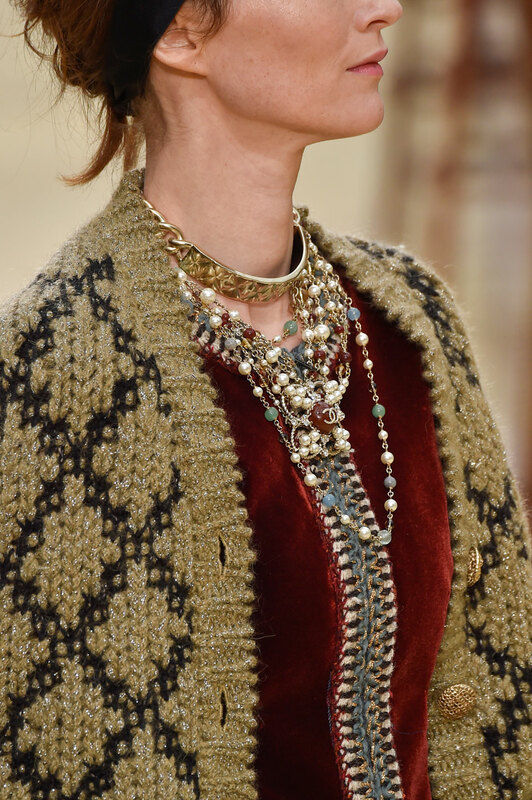 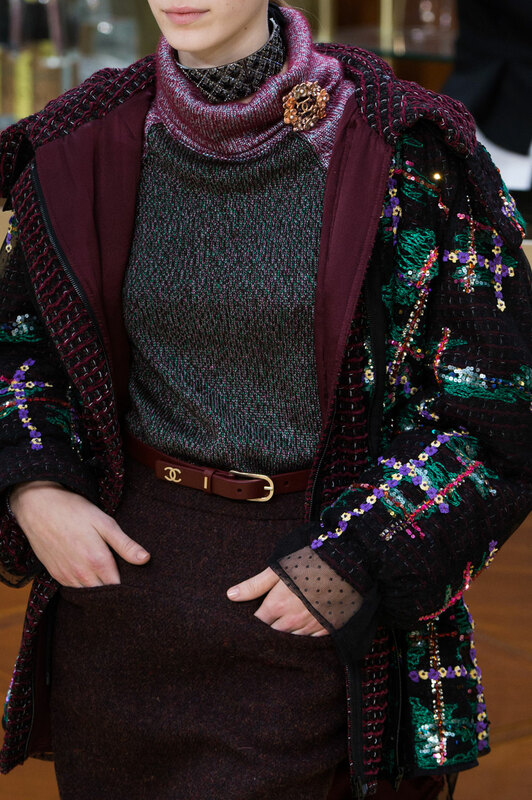 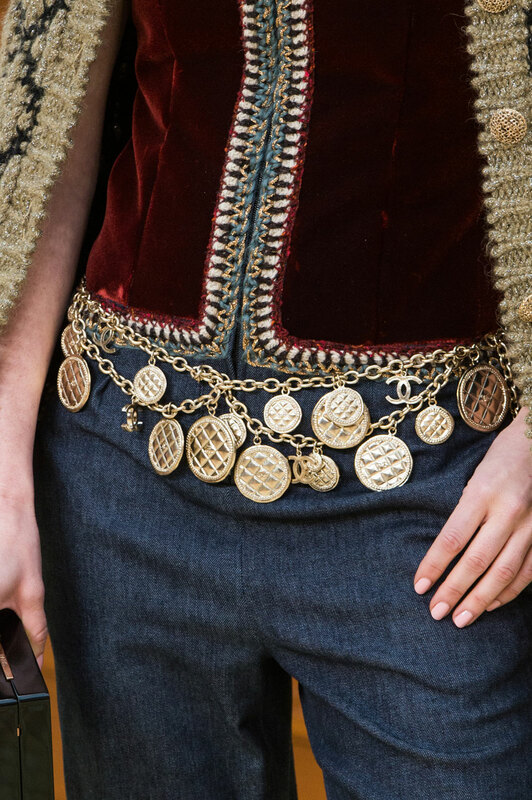 The German fashion designer also added sweater dresses decorated with pearls, cropped and flared jeans worn with a gold coin belt and a metallic cardigan which gave a relaxed feel. 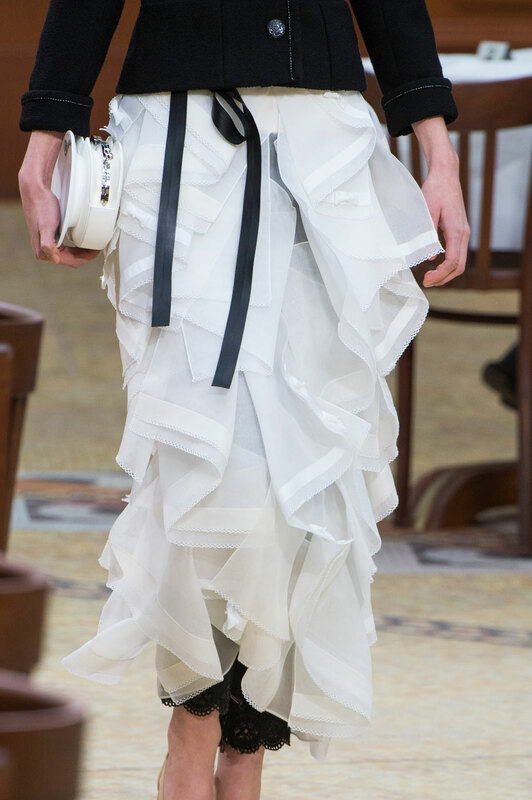 There were ruffles galore with tiered long ruffled skirts, pink blouses with frilled high necks and pretty textured dresses which added femininity and romanticism. 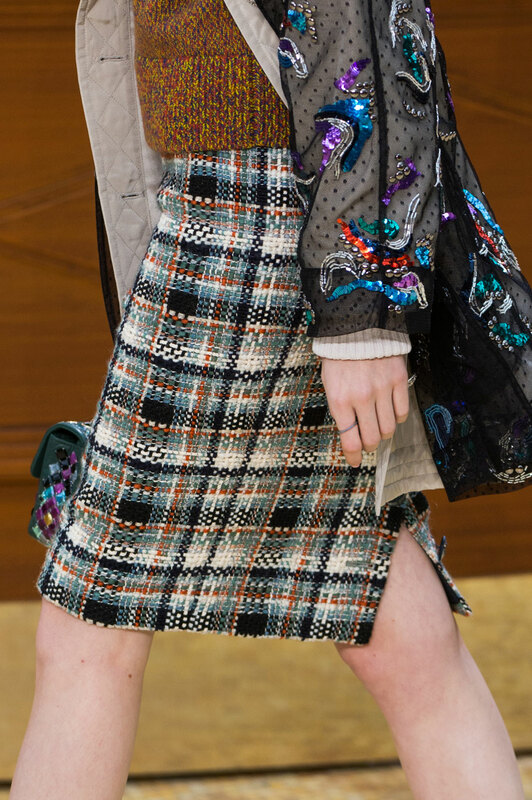 Long sheer skirts were layered over skinny trousers, and a checked, striped, floral and zigzag print motif ran throughout the line adorning, skirt suits, capes and coats and even on the looks of the two male models that also walked the show. 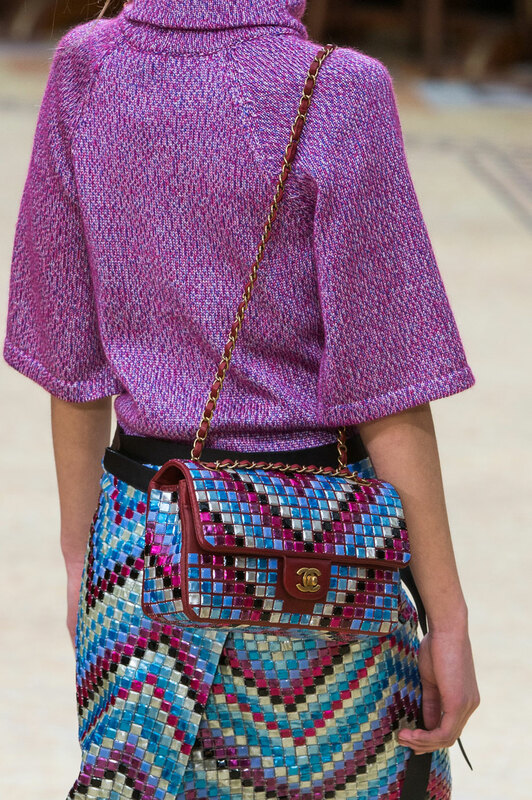 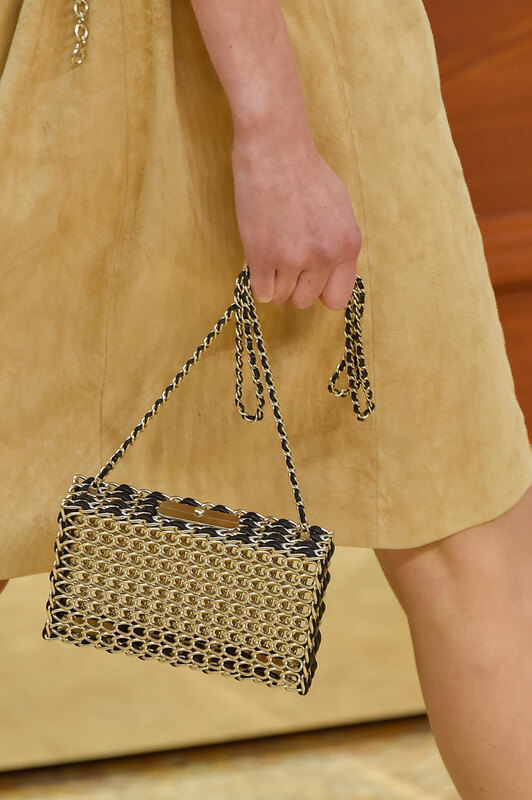 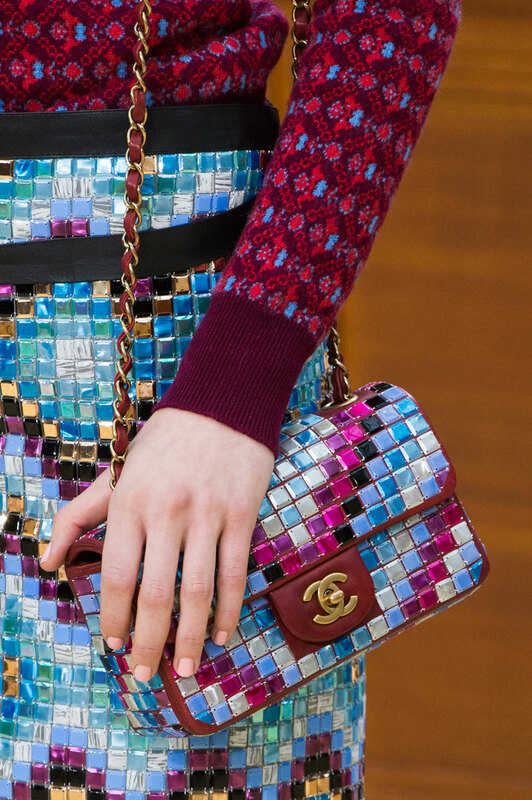 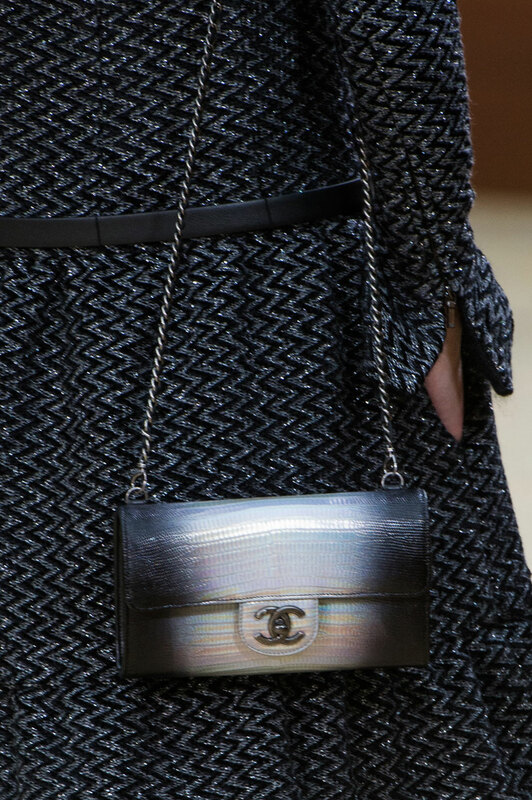 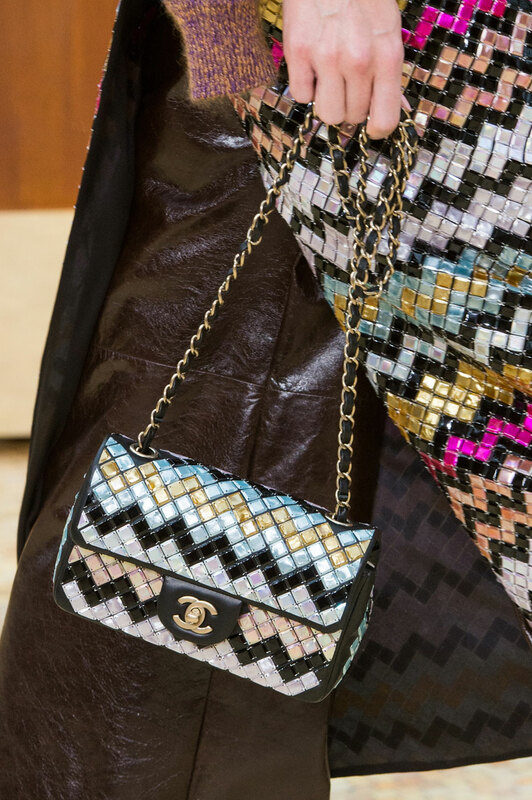 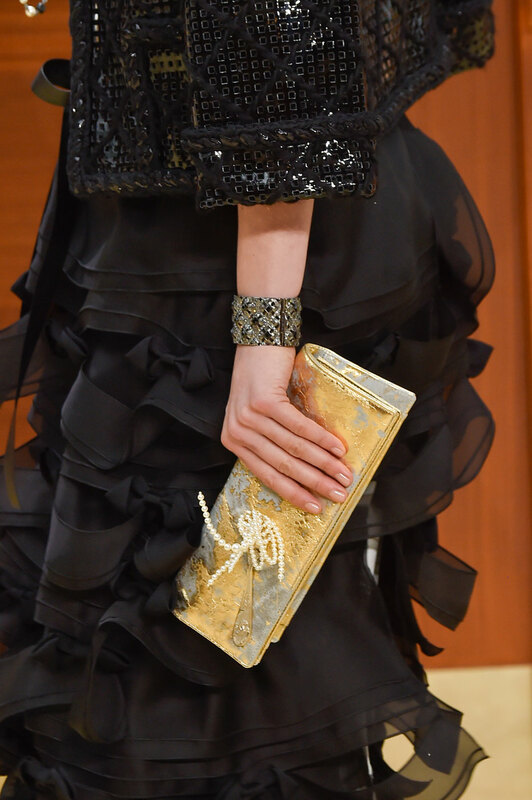 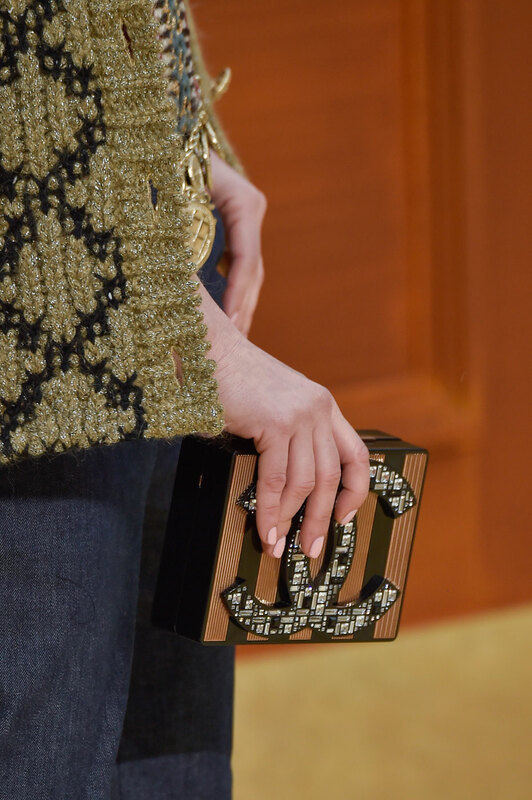 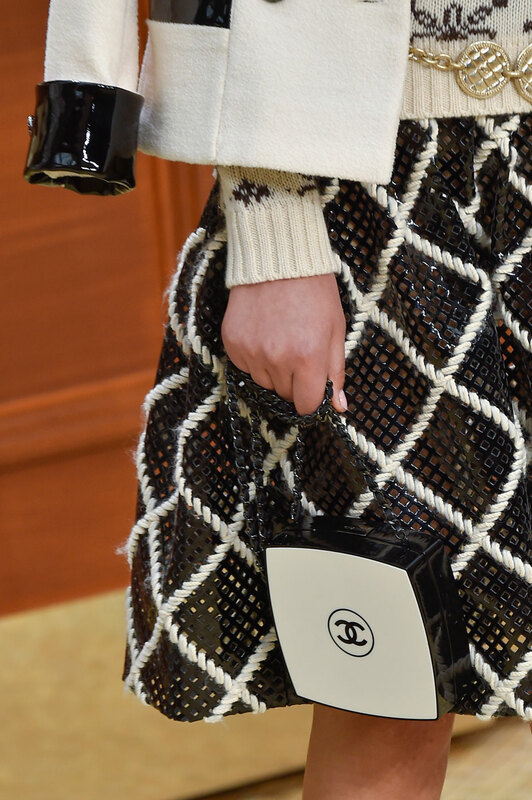 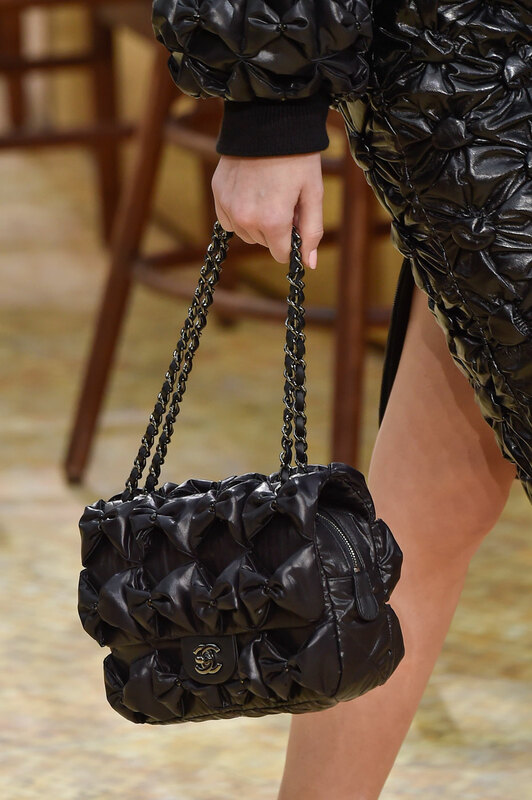 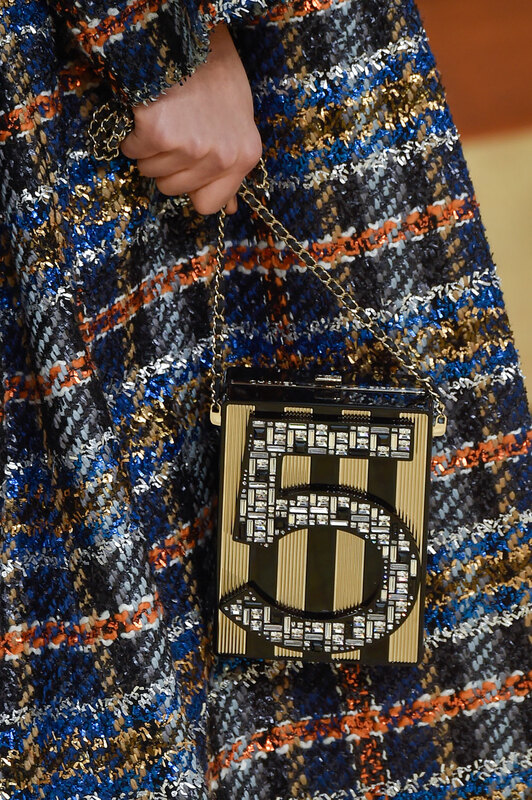 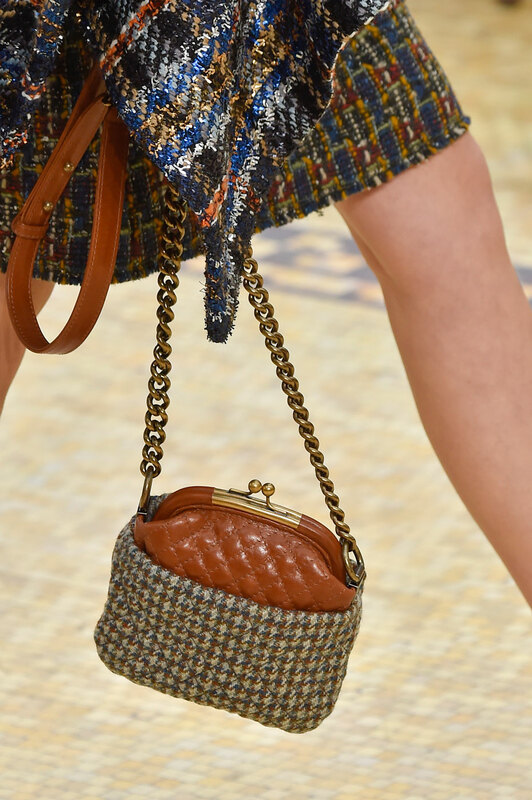 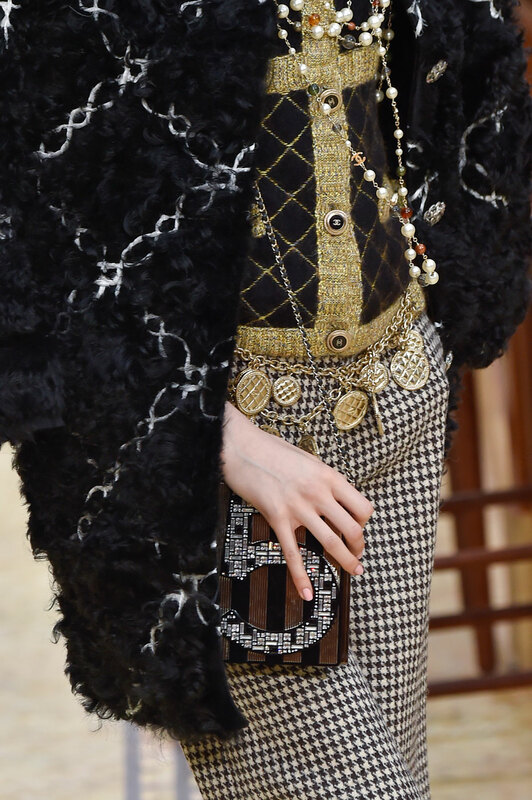 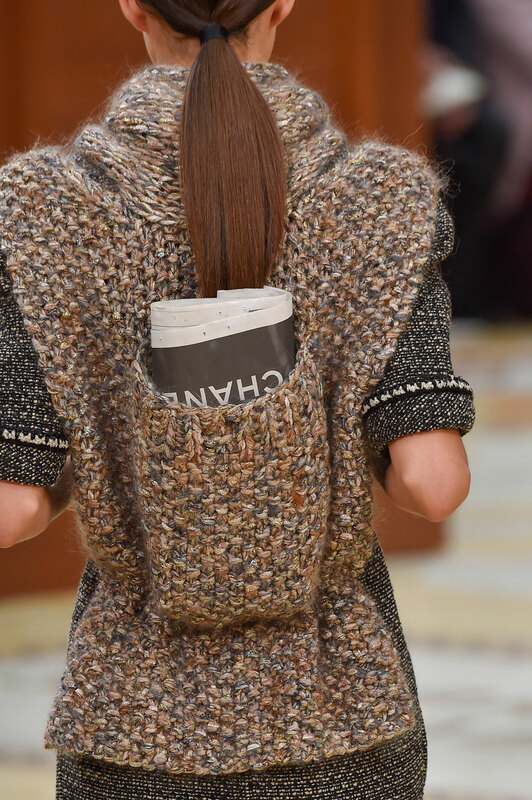 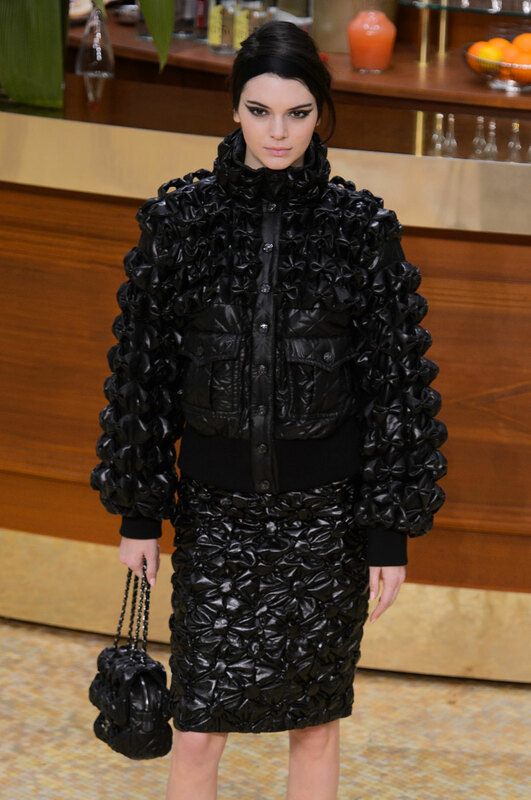 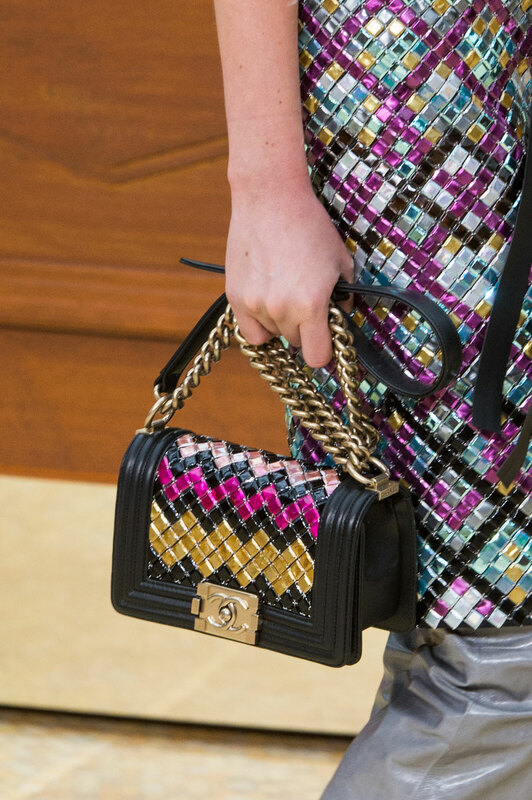 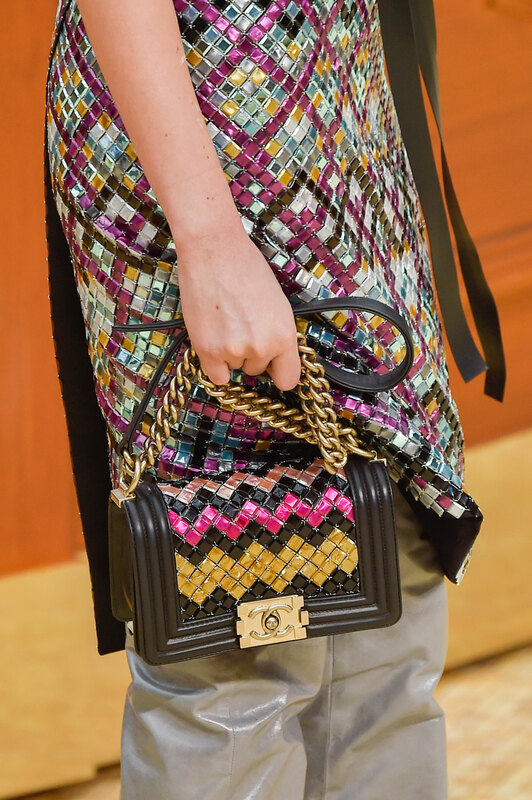 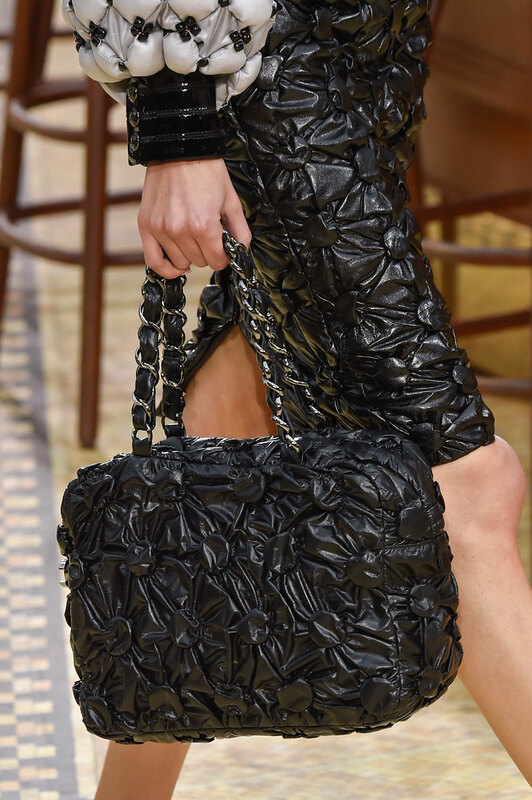 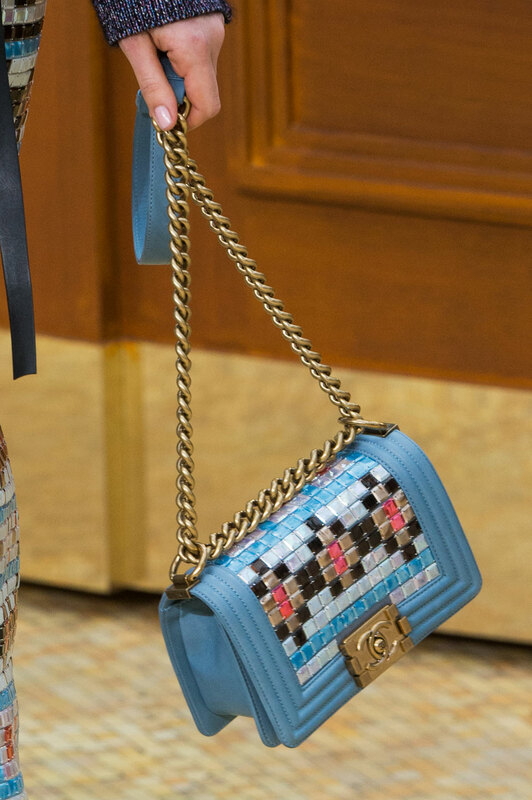 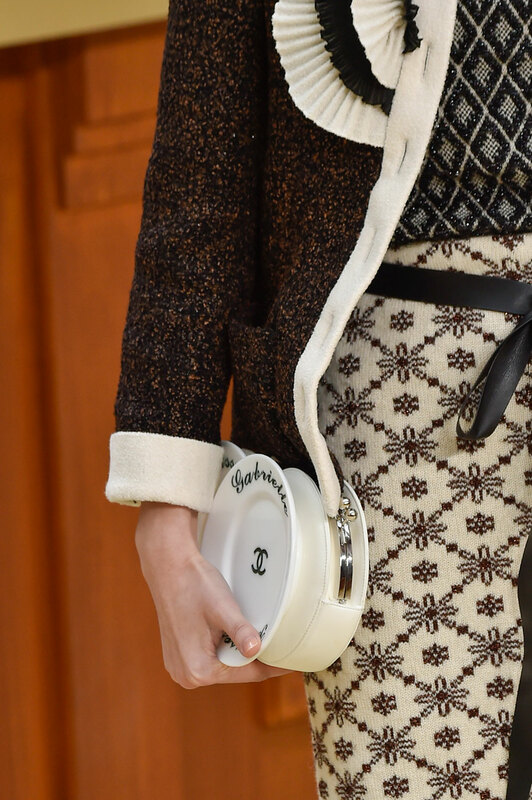 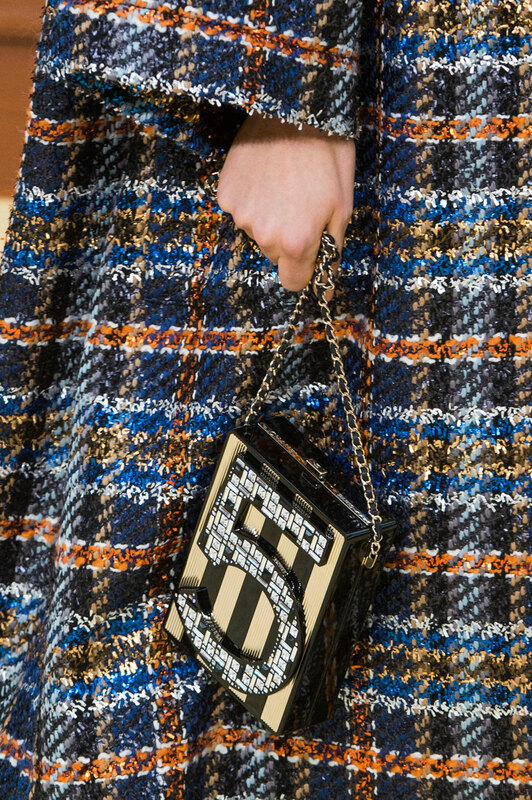 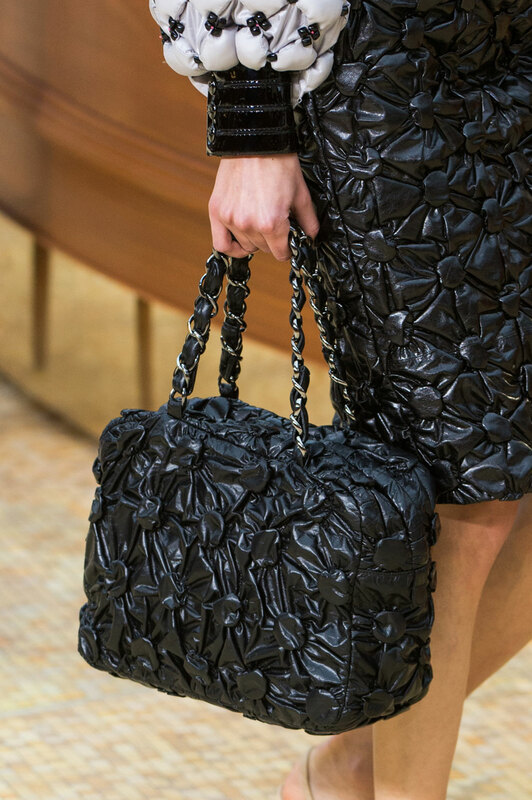 There was also the reveal of the new Chanel accessory, the new plate bag, which is sure to be a hit. 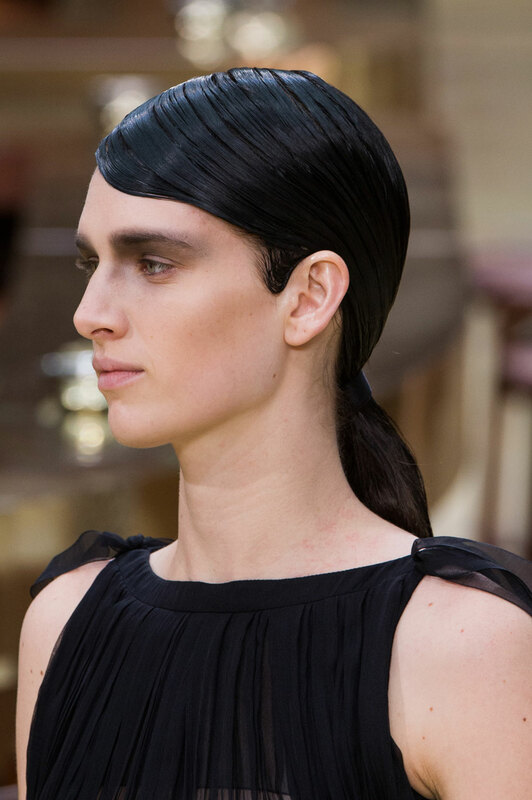 Hair was kept sophisticated in a messy chignon accessorised with a black ribbon headband and a ‘CC’ hair pin. 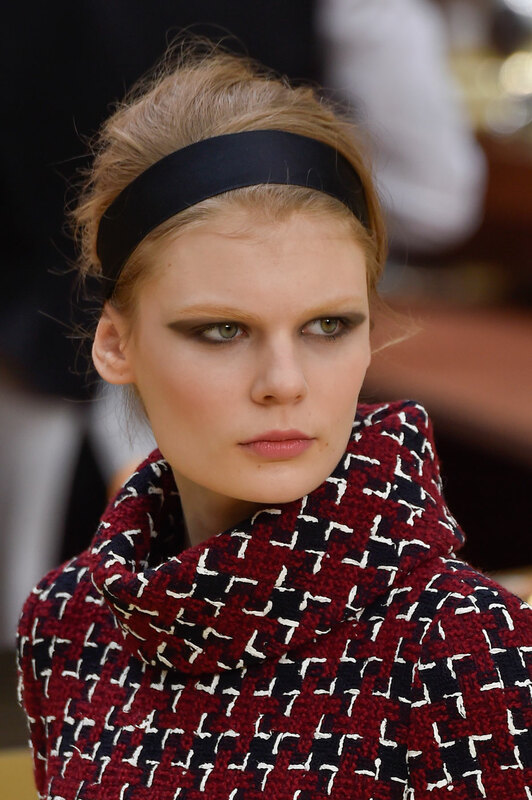 Make up was kept natural with a smoky eye adding drama. 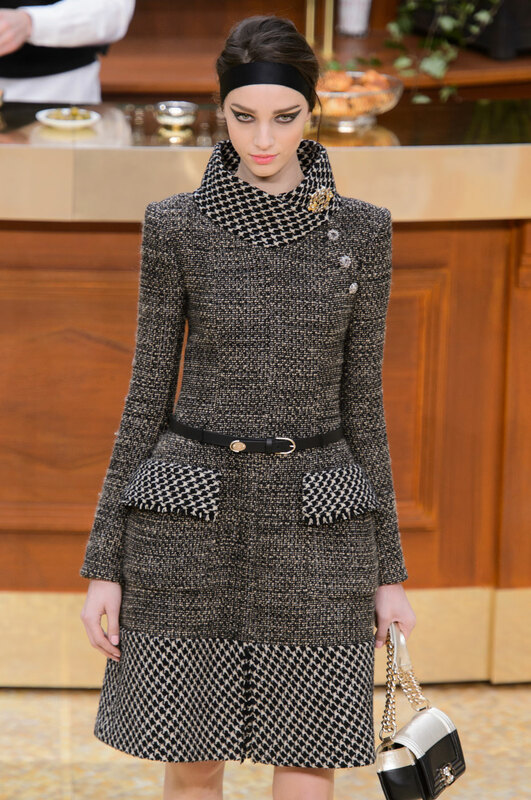 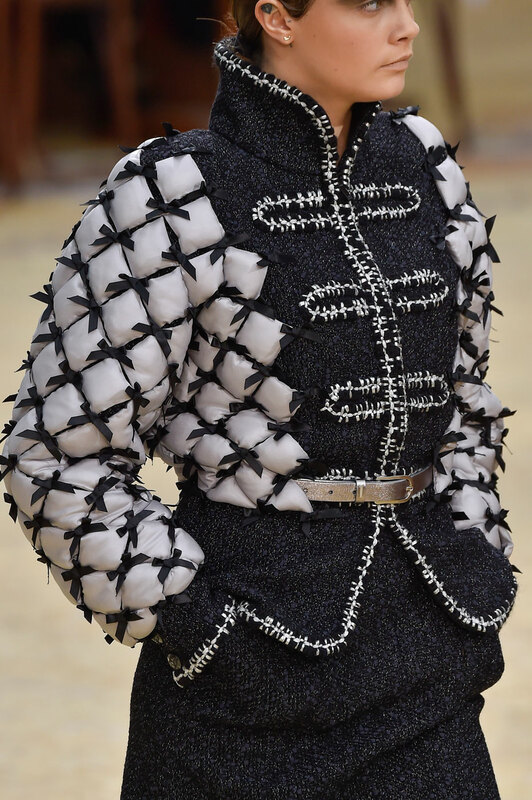 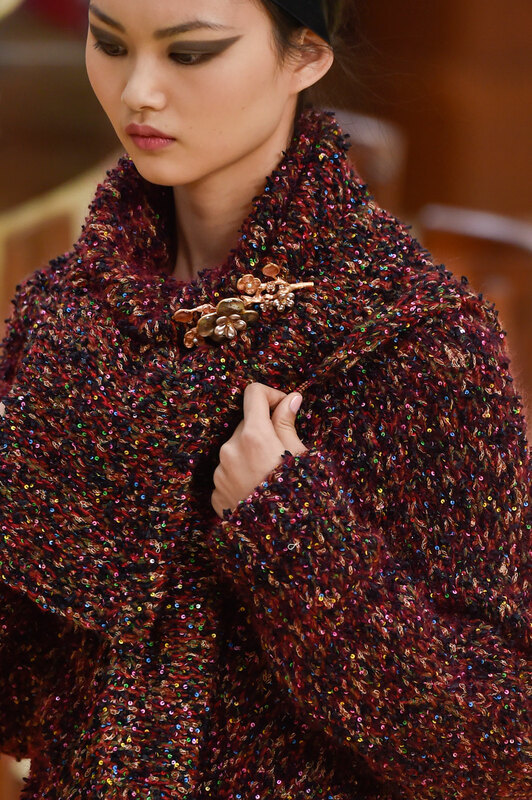 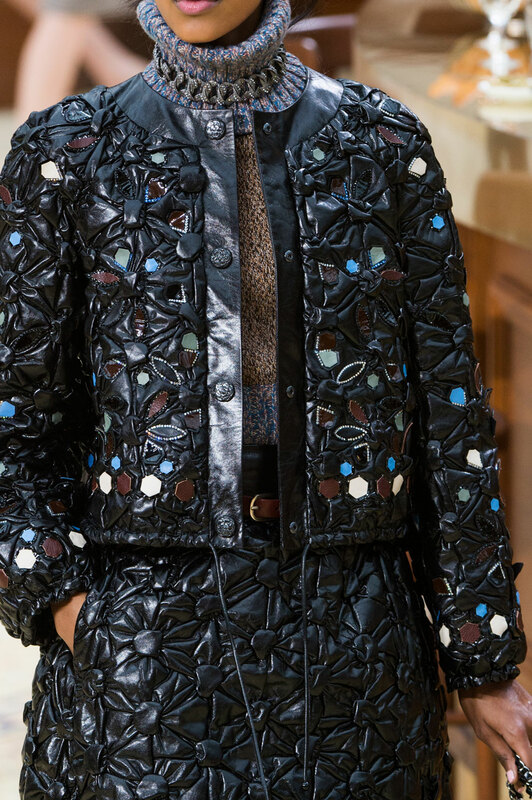 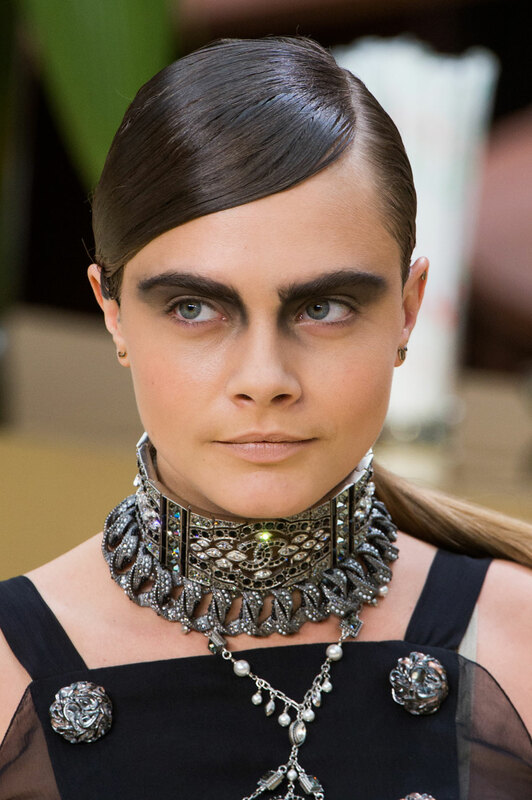 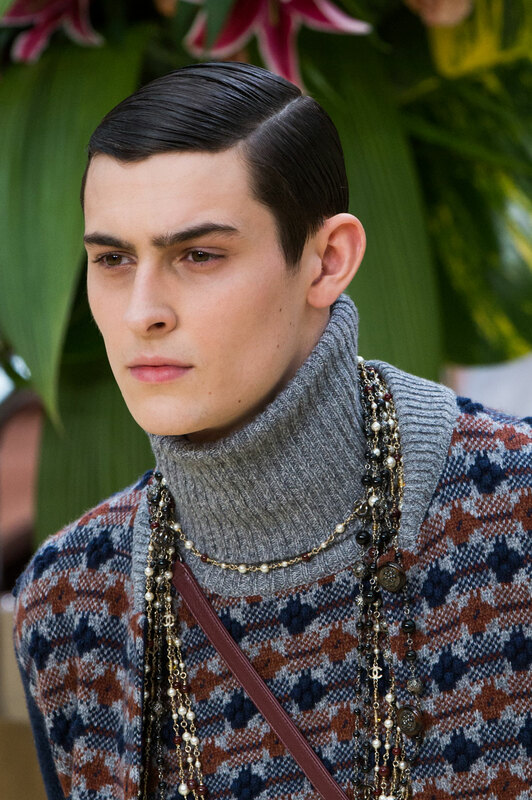 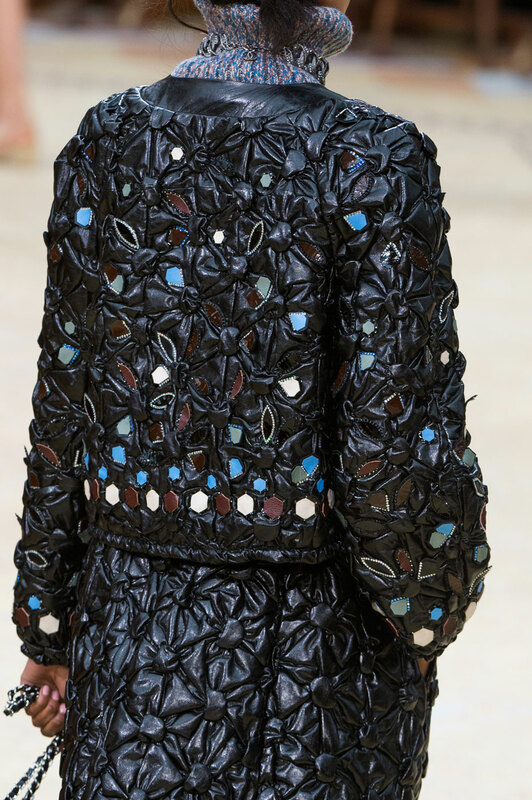 The collection was elegantly Chanel and we don’t expect anything but.